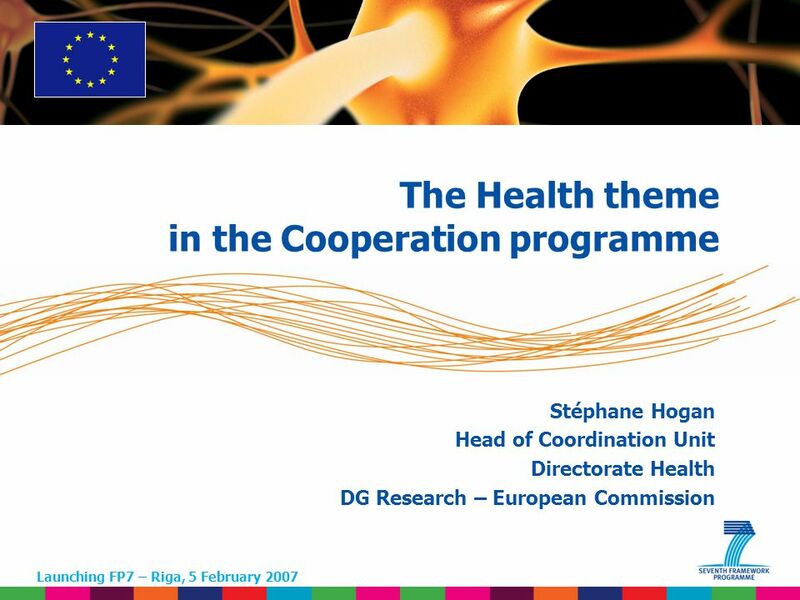 1 Stéphane Hogan Head of Coordination Unit Directorate Health DG Research – European Commission Launching FP7 – Riga, 5 February 2007 The Health theme. 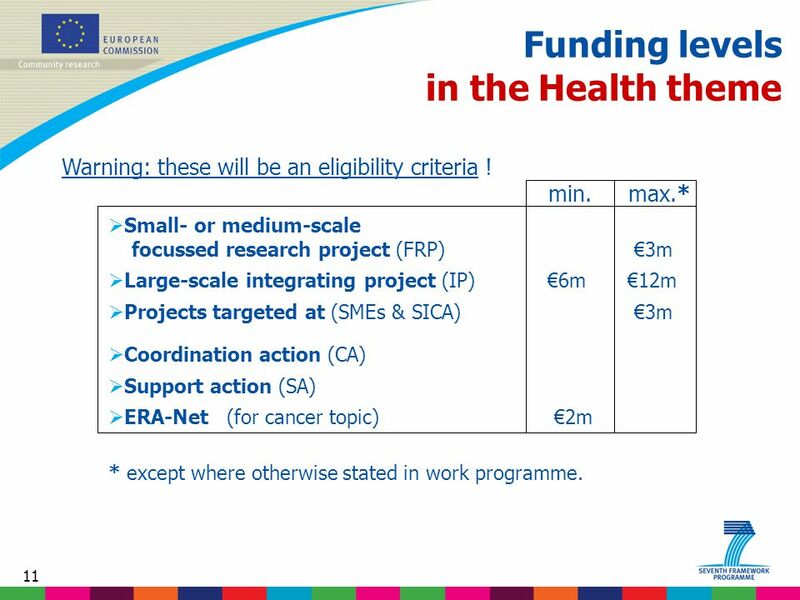 11 11 Funding levels in the Health theme Warning: these will be an eligibility criteria ! min. max. 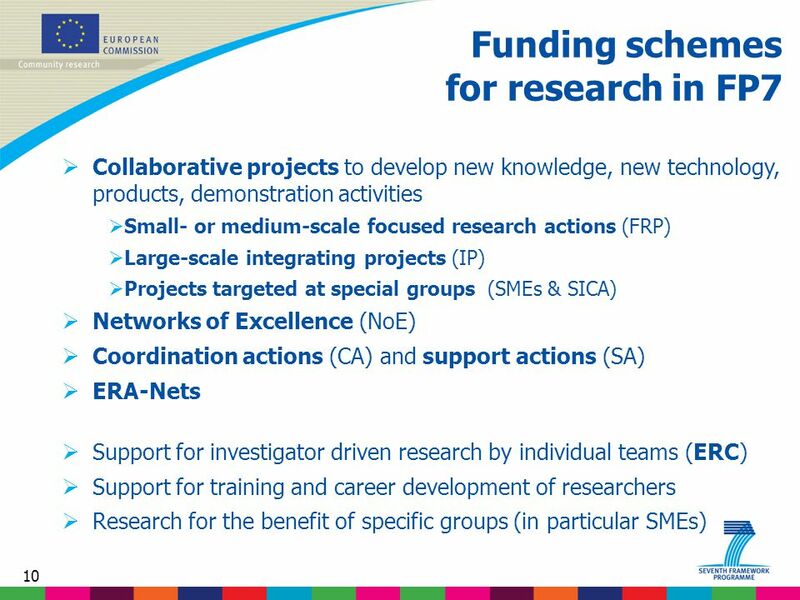 *  Small- or medium-scale focussed research project (FRP) €3m  Large-scale integrating project (IP) €6m €12m  Projects targeted at (SMEs & SICA) €3m  Coordination action (CA)  Support action (SA)  ERA-Net (for cancer topic) €2m * except where otherwise stated in work programme. 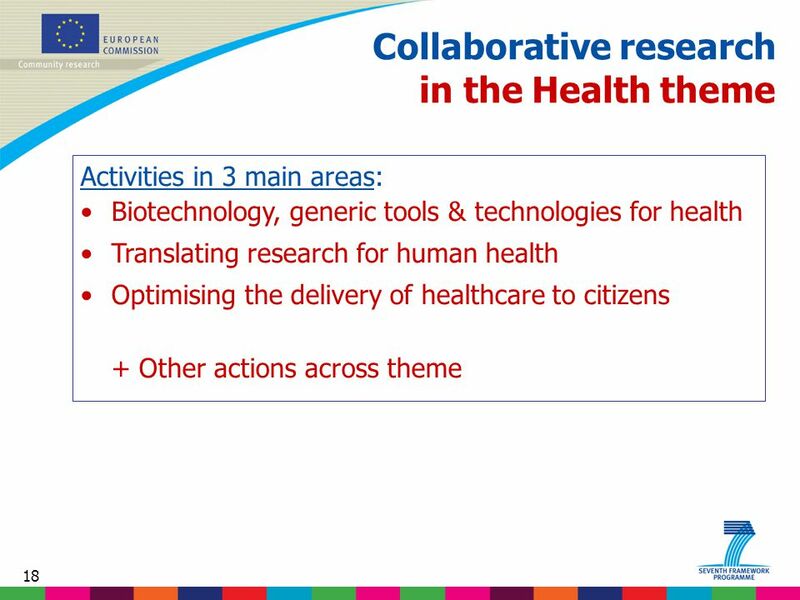 13 13 Collaborative research in the Health theme Activities in 3 main areas: Biotechnology, generic tools and technologies for human health Translating research for human health Optimising the delivery of healthcare to citizens Main features of transition from FP6 to FP7: Continuity; broader scope; less focus on genomics; emphasis on translational research; health policy driven research strongly reinforced. New: emerging epidemics, obesity, chronic diseases, biomedical technology & engineering. 19 19 Collaborative research in the Health theme 1: Biotechnology, generic tools and technologies  High-throughput research enhancing data generation, standardisation, acquisition & analysis  Detection, diagnosis and monitoring with emphasis on non-invasive or minimally invasive approaches  Predicting suitability, safety and efficacy of therapies develop and validate parameters, tools, methods and standards (mainly through IMI) and alternatives to animal testing  Innovative therapeutic approaches and interventions gene and cell therapy, regenerative medicine, immunotherapy and vaccines. 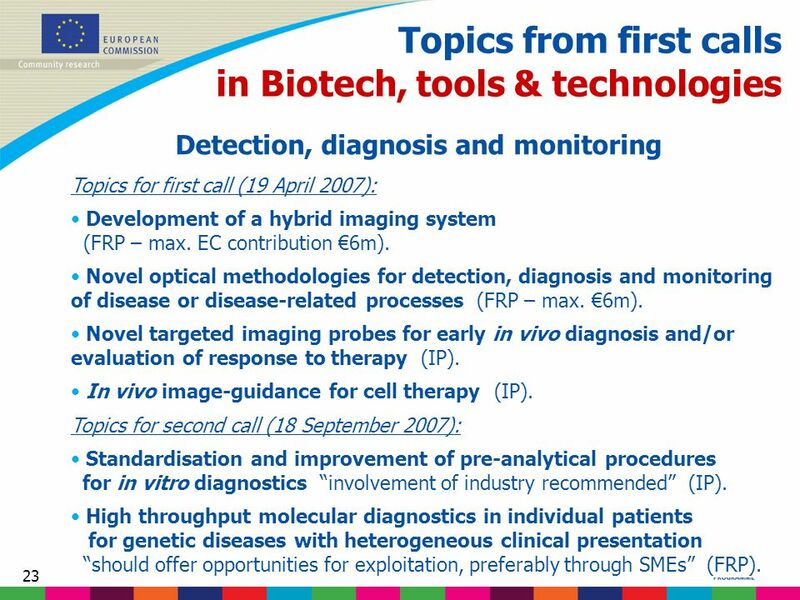 23 23 Topics from first calls in Biotech, tools & technologies Detection, diagnosis and monitoring Topics for first call (19 April 2007): Development of a hybrid imaging system (FRP – max. 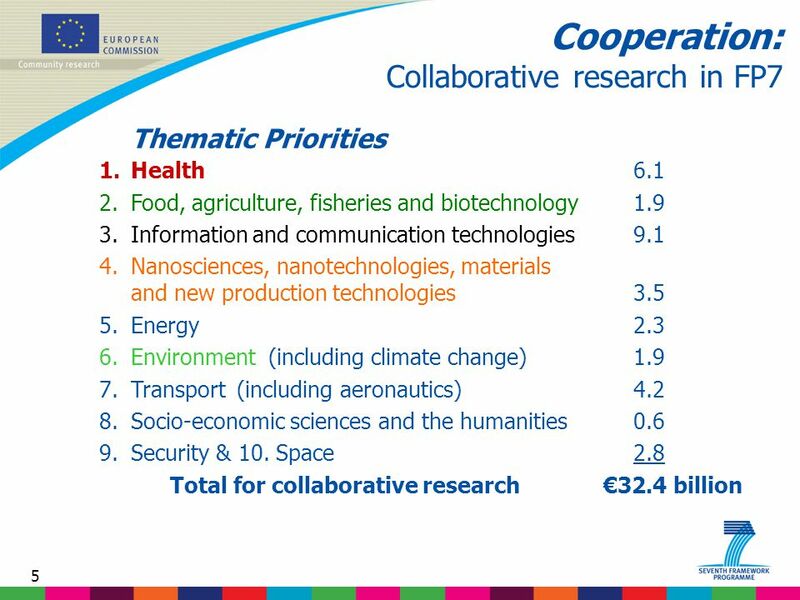 EC contribution €6m). Novel optical methodologies for detection, diagnosis and monitoring of disease or disease-related processes (FRP – max. €6m). Novel targeted imaging probes for early in vivo diagnosis and/or evaluation of response to therapy (IP). In vivo image-guidance for cell therapy (IP). 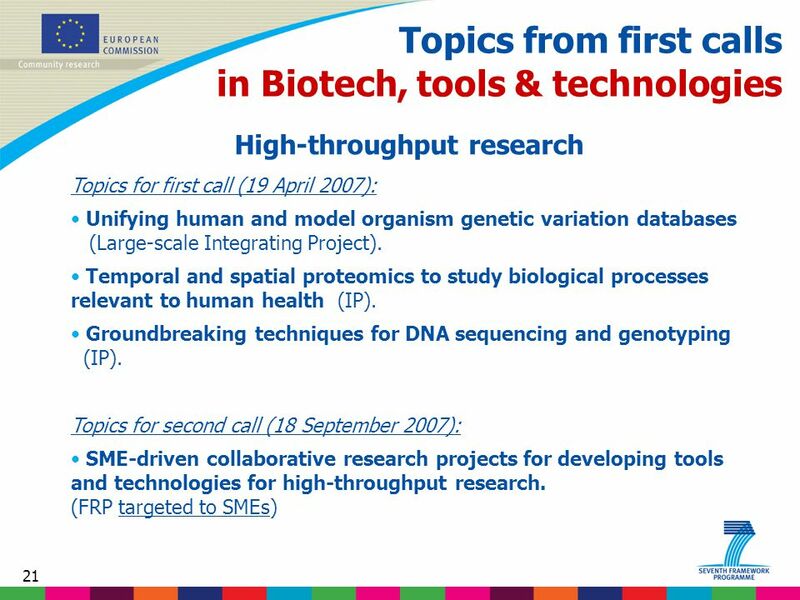 Topics for second call (18 September 2007): Standardisation and improvement of pre-analytical procedures for in vitro diagnostics “involvement of industry recommended” (IP). 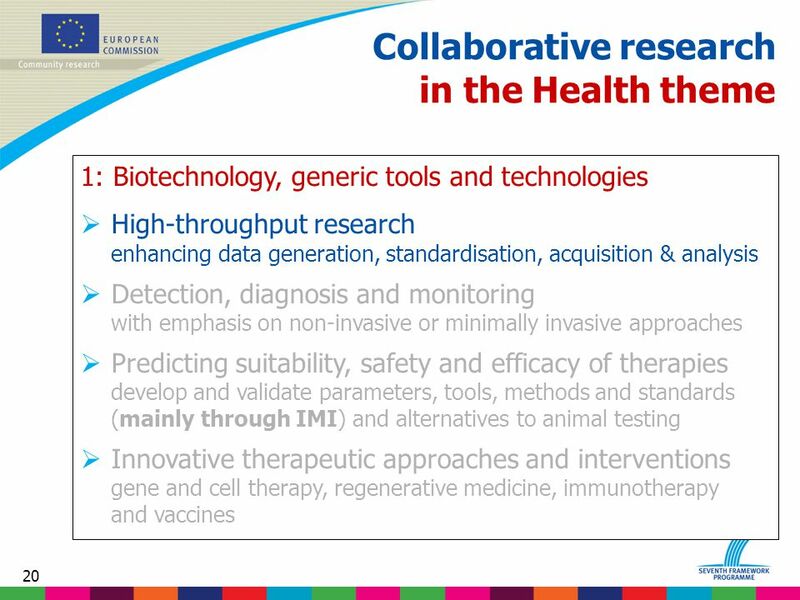 High throughput molecular diagnostics in individual patients for genetic diseases with heterogeneous clinical presentation “should offer opportunities for exploitation, preferably through SMEs” (FRP). 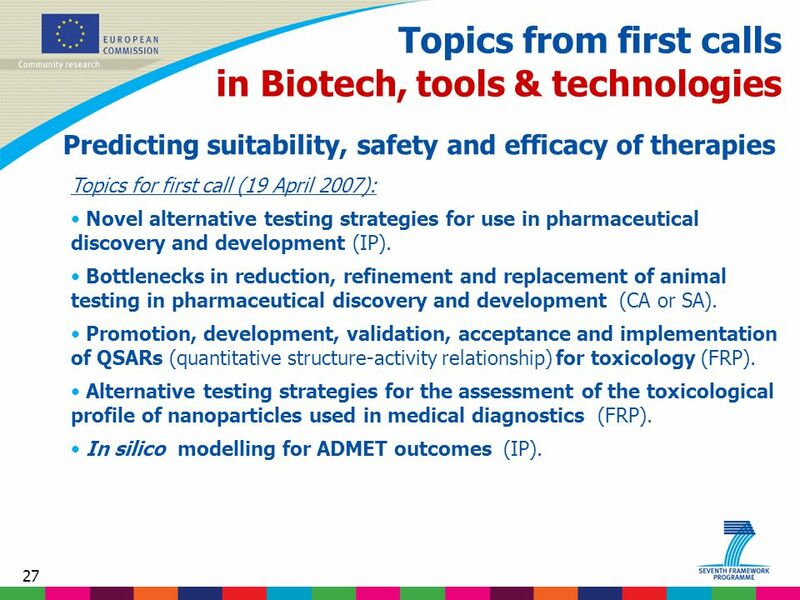 27 27 Topics from first calls in Biotech, tools & technologies Predicting suitability, safety and efficacy of therapies Topics for first call (19 April 2007): Novel alternative testing strategies for use in pharmaceutical discovery and development (IP). Bottlenecks in reduction, refinement and replacement of animal testing in pharmaceutical discovery and development (CA or SA). Promotion, development, validation, acceptance and implementation of QSARs (quantitative structure-activity relationship) for toxicology (FRP). Alternative testing strategies for the assessment of the toxicological profile of nanoparticles used in medical diagnostics (FRP). In silico modelling for ADMET outcomes (IP). 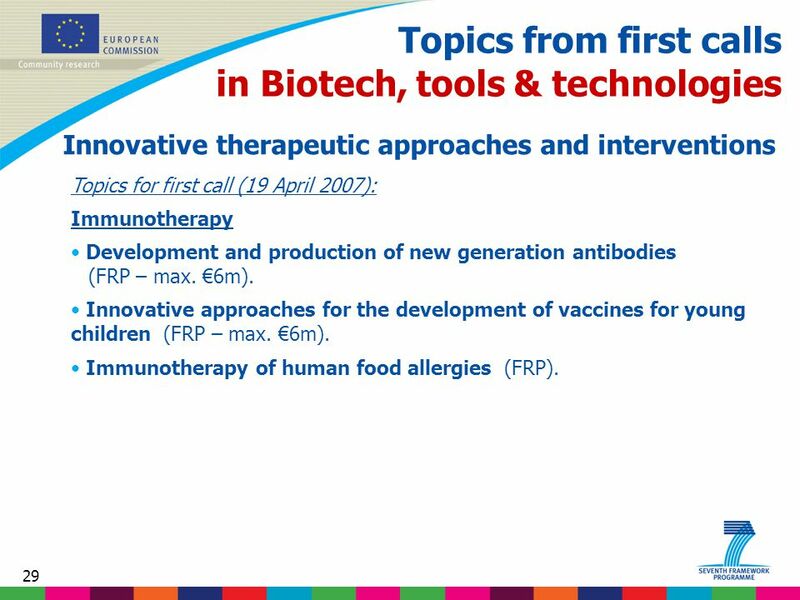 29 29 Topics from first calls in Biotech, tools & technologies Innovative therapeutic approaches and interventions Topics for first call (19 April 2007): Immunotherapy Development and production of new generation antibodies (FRP – max. €6m). 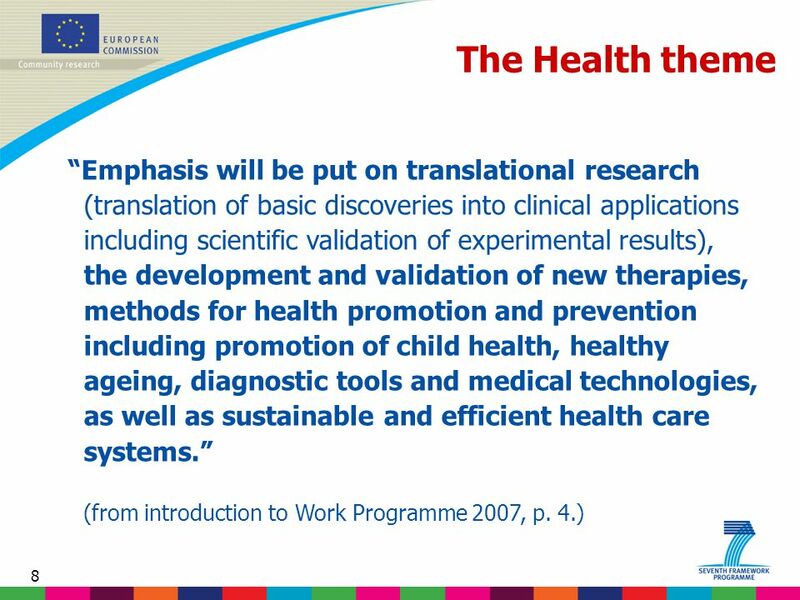 Innovative approaches for the development of vaccines for young children (FRP – max. €6m). Immunotherapy of human food allergies (FRP). 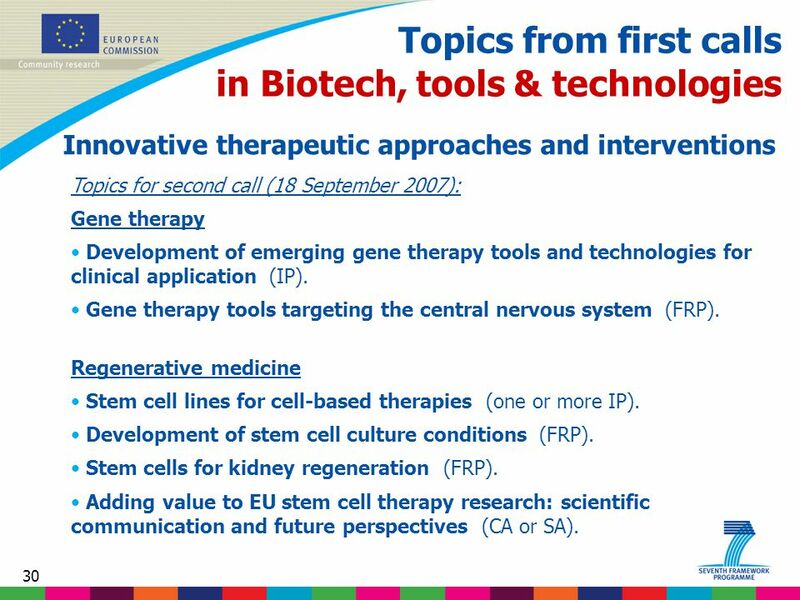 30 30 Topics from first calls in Biotech, tools & technologies Innovative therapeutic approaches and interventions Topics for second call (18 September 2007): Gene therapy Development of emerging gene therapy tools and technologies for clinical application (IP). Gene therapy tools targeting the central nervous system (FRP). Regenerative medicine Stem cell lines for cell-based therapies (one or more IP). Development of stem cell culture conditions (FRP). Stem cells for kidney regeneration (FRP). 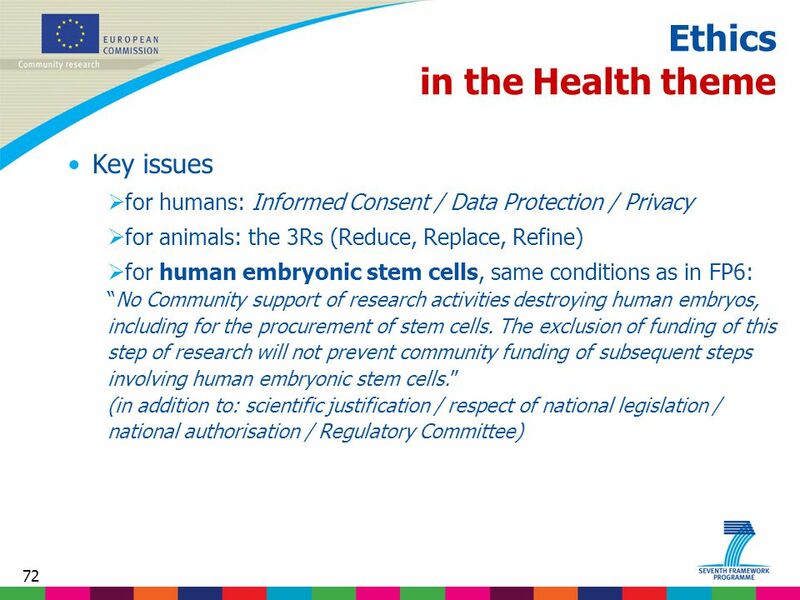 Adding value to EU stem cell therapy research: scientific communication and future perspectives (CA or SA). 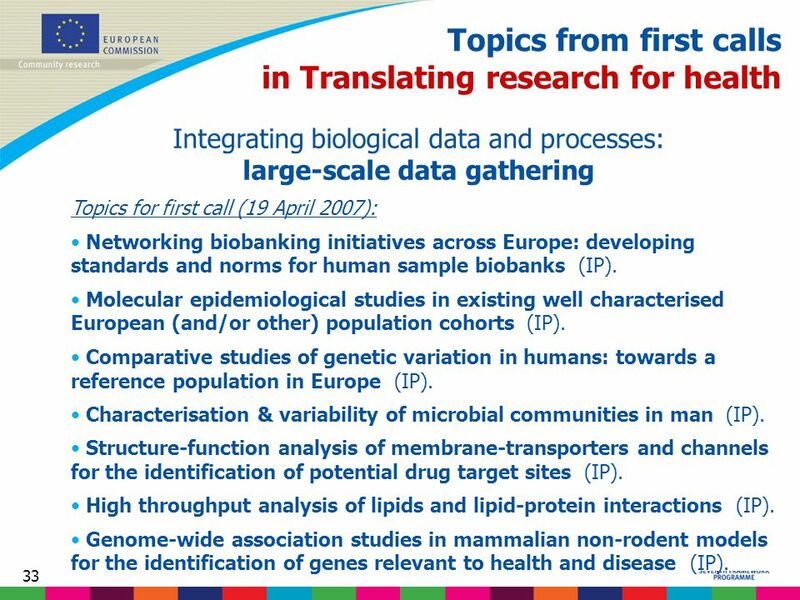 33 33 Topics from first calls in Translating research for health Integrating biological data and processes: large-scale data gathering Topics for first call (19 April 2007): Networking biobanking initiatives across Europe: developing standards and norms for human sample biobanks (IP). Molecular epidemiological studies in existing well characterised European (and/or other) population cohorts (IP). Comparative studies of genetic variation in humans: towards a reference population in Europe (IP). Characterisation & variability of microbial communities in man (IP). Structure-function analysis of membrane-transporters and channels for the identification of potential drug target sites (IP). High throughput analysis of lipids and lipid-protein interactions (IP). Genome-wide association studies in mammalian non-rodent models for the identification of genes relevant to health and disease (IP). 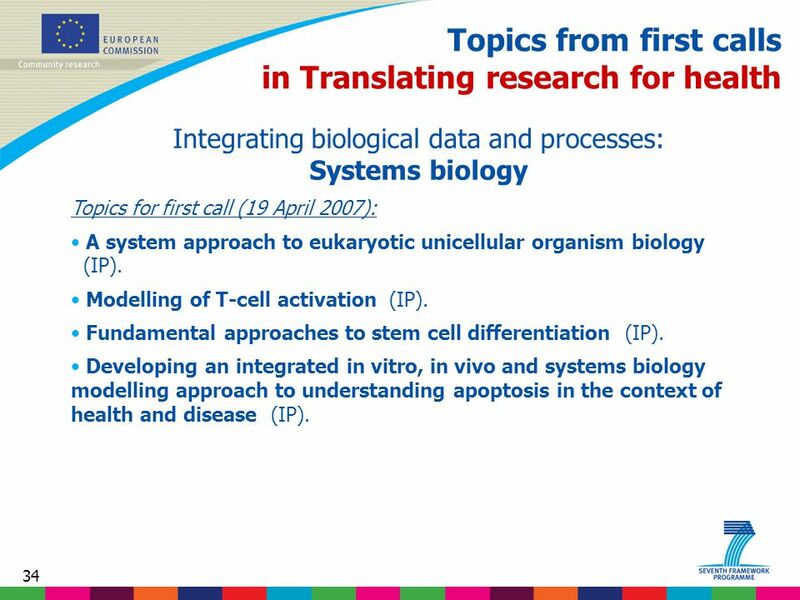 34 34 Topics from first calls in Translating research for health Integrating biological data and processes: Systems biology Topics for first call (19 April 2007): A system approach to eukaryotic unicellular organism biology (IP). Modelling of T-cell activation (IP). Fundamental approaches to stem cell differentiation (IP). Developing an integrated in vitro, in vivo and systems biology modelling approach to understanding apoptosis in the context of health and disease (IP). 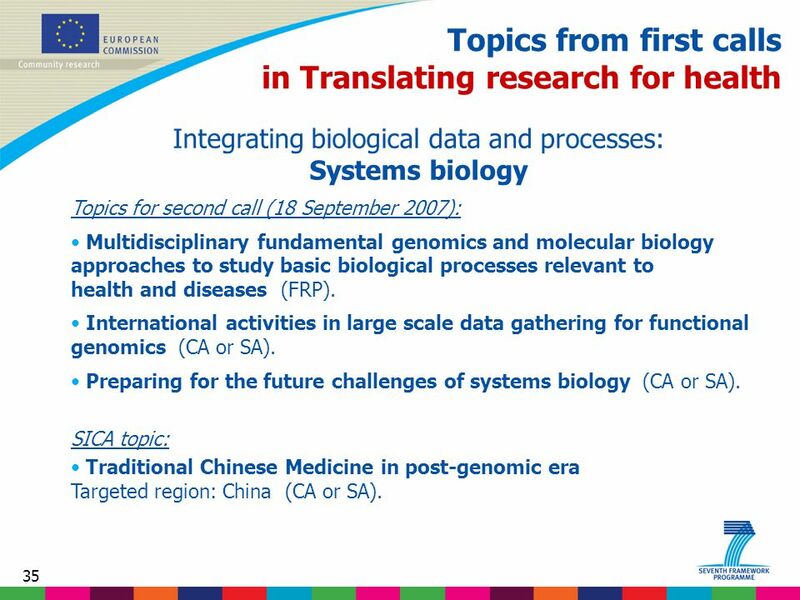 35 35 Topics from first calls in Translating research for health Integrating biological data and processes: Systems biology Topics for second call (18 September 2007): Multidisciplinary fundamental genomics and molecular biology approaches to study basic biological processes relevant to health and diseases (FRP). International activities in large scale data gathering for functional genomics (CA or SA). Preparing for the future challenges of systems biology (CA or SA). SICA topic: Traditional Chinese Medicine in post-genomic era Targeted region: China (CA or SA). 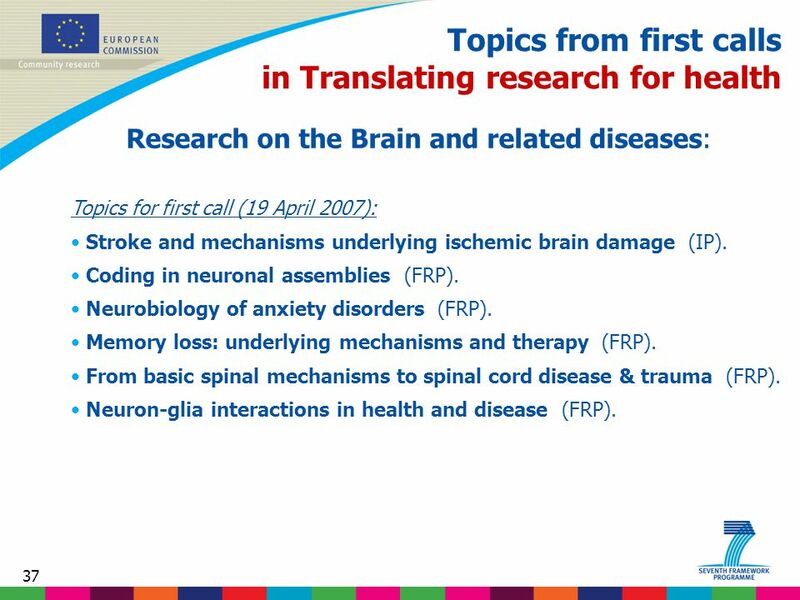 37 37 Topics from first calls in Translating research for health Research on the Brain and related diseases: Topics for first call (19 April 2007): Stroke and mechanisms underlying ischemic brain damage (IP). Coding in neuronal assemblies (FRP). Neurobiology of anxiety disorders (FRP). Memory loss: underlying mechanisms and therapy (FRP). From basic spinal mechanisms to spinal cord disease & trauma (FRP). Neuron-glia interactions in health and disease (FRP). 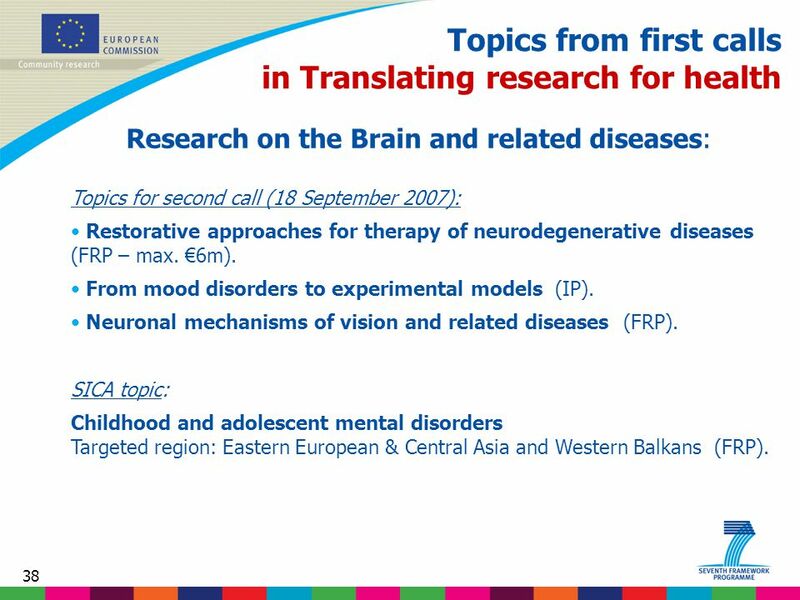 38 38 Topics from first calls in Translating research for health Research on the Brain and related diseases: Topics for second call (18 September 2007): Restorative approaches for therapy of neurodegenerative diseases (FRP – max. €6m). From mood disorders to experimental models (IP). Neuronal mechanisms of vision and related diseases (FRP). SICA topic: Childhood and adolescent mental disorders Targeted region: Eastern European & Central Asia and Western Balkans (FRP). 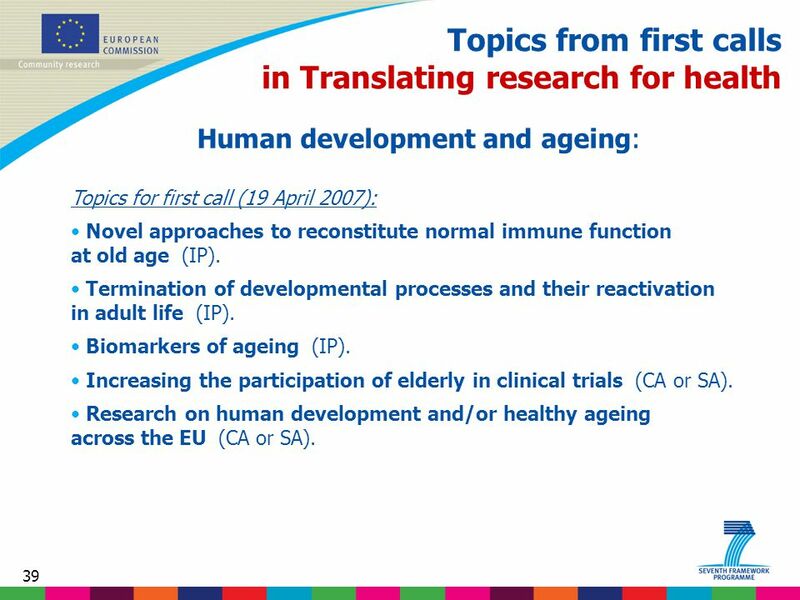 39 39 Topics from first calls in Translating research for health Human development and ageing: Topics for first call (19 April 2007): Novel approaches to reconstitute normal immune function at old age (IP). Termination of developmental processes and their reactivation in adult life (IP). Biomarkers of ageing (IP). Increasing the participation of elderly in clinical trials (CA or SA). 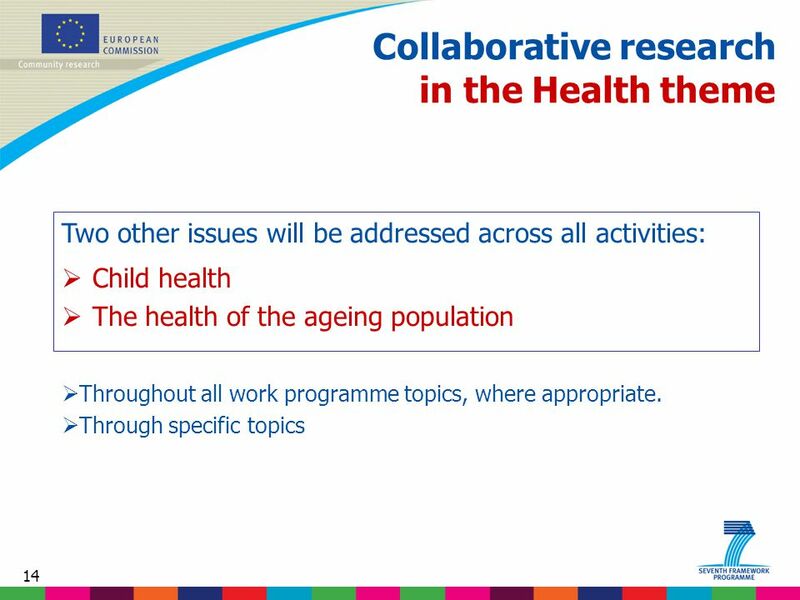 Research on human development and/or healthy ageing across the EU (CA or SA). 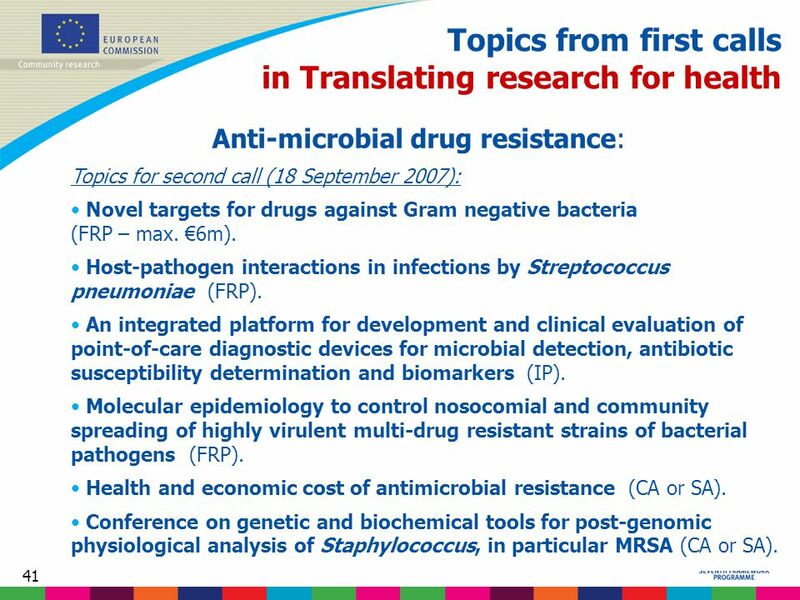 41 41 Topics from first calls in Translating research for health Anti-microbial drug resistance: Topics for second call (18 September 2007): Novel targets for drugs against Gram negative bacteria (FRP – max. €6m). Host-pathogen interactions in infections by Streptococcus pneumoniae (FRP). An integrated platform for development and clinical evaluation of point-of-care diagnostic devices for microbial detection, antibiotic susceptibility determination and biomarkers (IP). Molecular epidemiology to control nosocomial and community spreading of highly virulent multi-drug resistant strains of bacterial pathogens (FRP). Health and economic cost of antimicrobial resistance (CA or SA). Conference on genetic and biochemical tools for post-genomic physiological analysis of Staphylococcus, in particular MRSA (CA or SA). 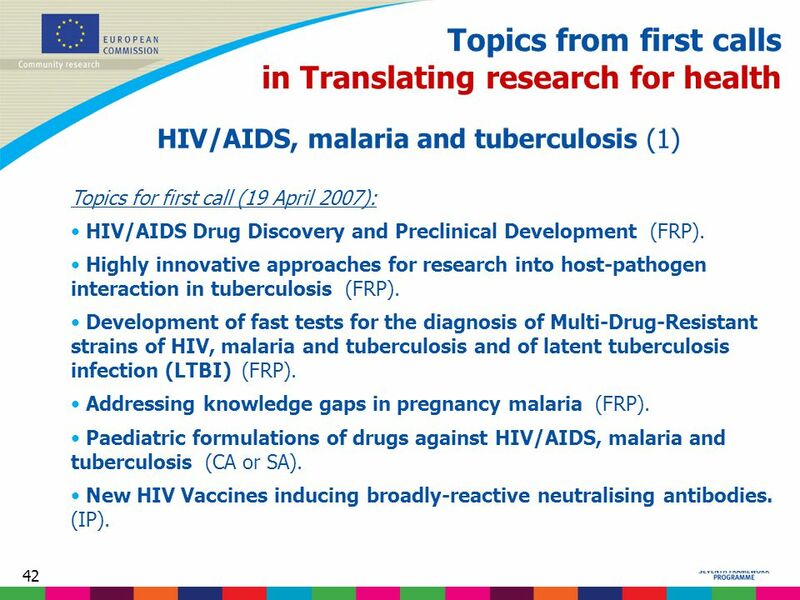 42 42 Topics from first calls in Translating research for health HIV/AIDS, malaria and tuberculosis (1) Topics for first call (19 April 2007): HIV/AIDS Drug Discovery and Preclinical Development (FRP). 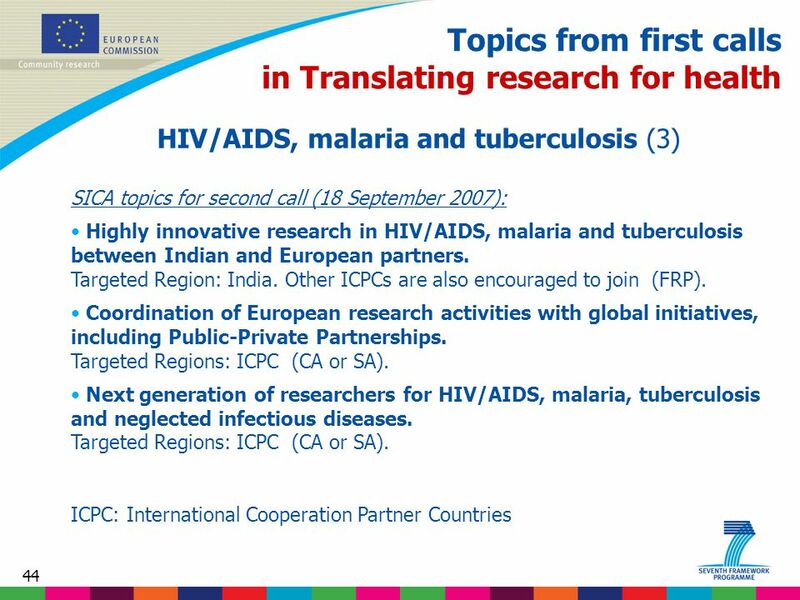 Highly innovative approaches for research into host-pathogen interaction in tuberculosis (FRP). Development of fast tests for the diagnosis of Multi-Drug-Resistant strains of HIV, malaria and tuberculosis and of latent tuberculosis infection (LTBI) (FRP). Addressing knowledge gaps in pregnancy malaria (FRP). Paediatric formulations of drugs against HIV/AIDS, malaria and tuberculosis (CA or SA). New HIV Vaccines inducing broadly-reactive neutralising antibodies. (IP). 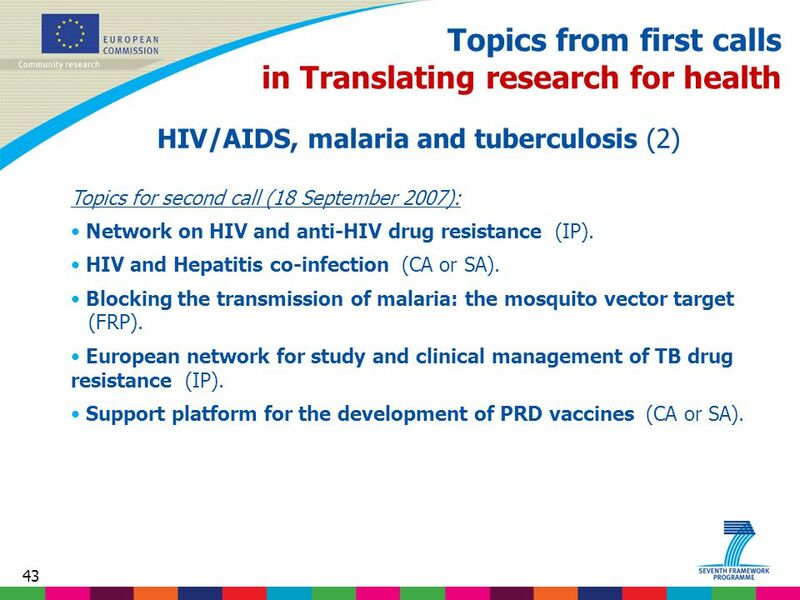 43 43 Topics from first calls in Translating research for health HIV/AIDS, malaria and tuberculosis (2) Topics for second call (18 September 2007): Network on HIV and anti-HIV drug resistance (IP). HIV and Hepatitis co-infection (CA or SA). Blocking the transmission of malaria: the mosquito vector target (FRP). 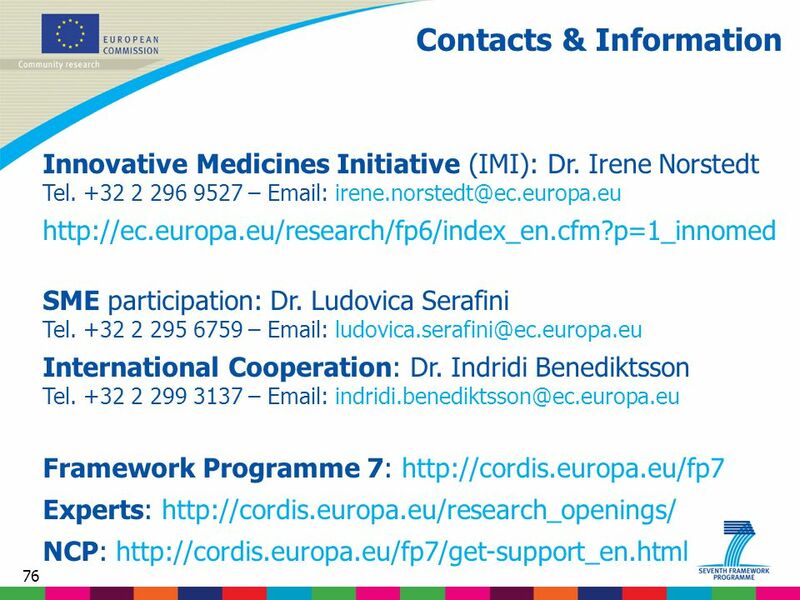 European network for study and clinical management of TB drug resistance (IP). 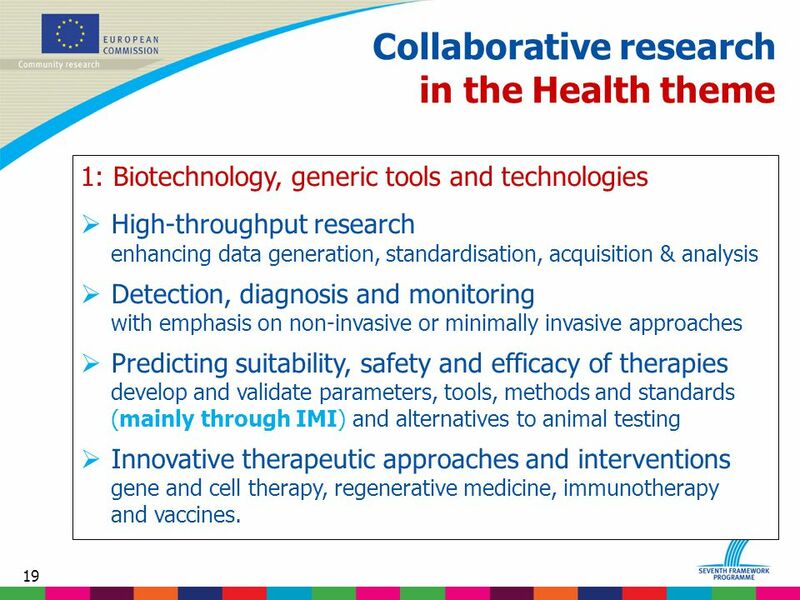 Support platform for the development of PRD vaccines (CA or SA). 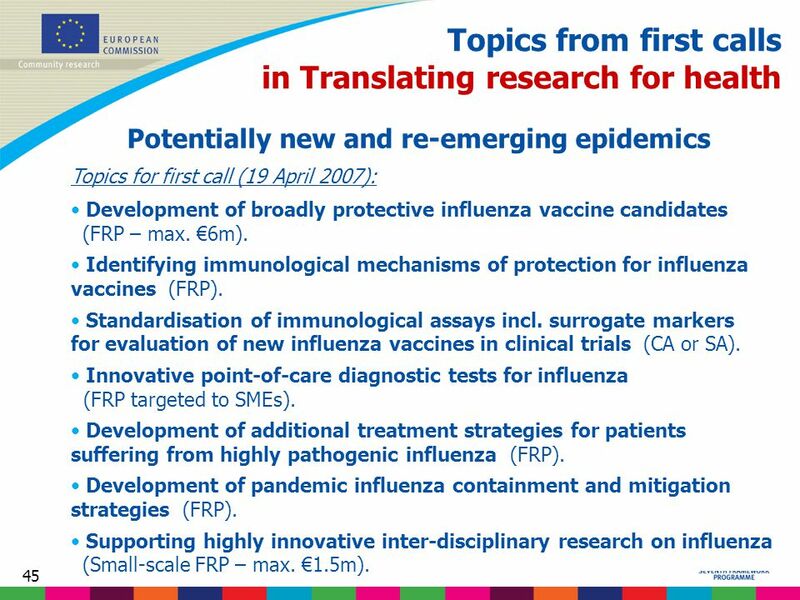 45 45 Topics from first calls in Translating research for health Potentially new and re-emerging epidemics Topics for first call (19 April 2007): Development of broadly protective influenza vaccine candidates (FRP – max. €6m). Identifying immunological mechanisms of protection for influenza vaccines (FRP). Standardisation of immunological assays incl. surrogate markers for evaluation of new influenza vaccines in clinical trials (CA or SA). 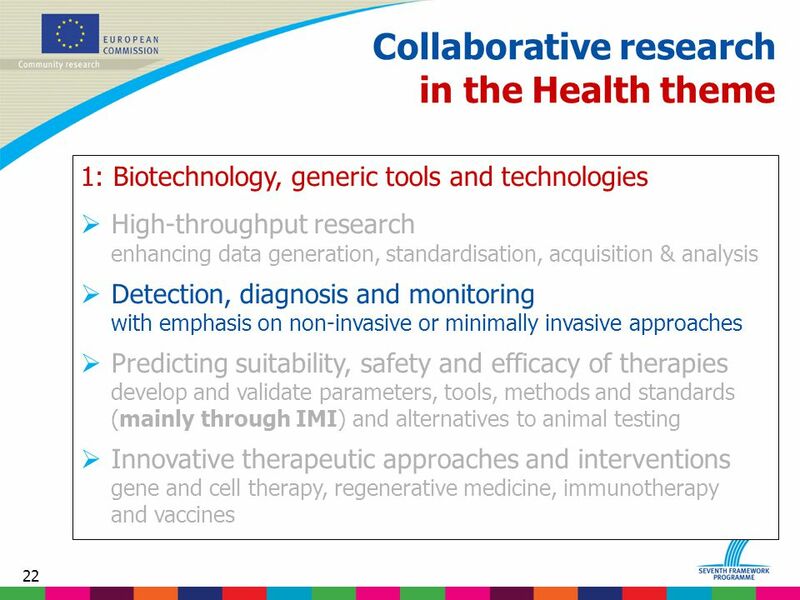 Innovative point-of-care diagnostic tests for influenza (FRP targeted to SMEs). Development of additional treatment strategies for patients suffering from highly pathogenic influenza (FRP). Development of pandemic influenza containment and mitigation strategies (FRP). Supporting highly innovative inter-disciplinary research on influenza (Small-scale FRP – max. €1.5m). 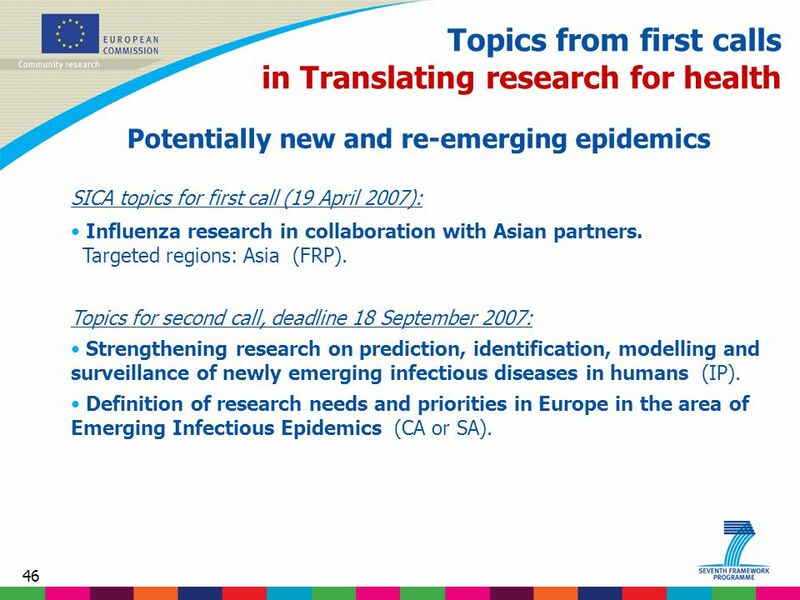 46 46 Topics from first calls in Translating research for health Potentially new and re-emerging epidemics SICA topics for first call (19 April 2007): Influenza research in collaboration with Asian partners. Targeted regions: Asia (FRP). Topics for second call, deadline 18 September 2007: Strengthening research on prediction, identification, modelling and surveillance of newly emerging infectious diseases in humans (IP). 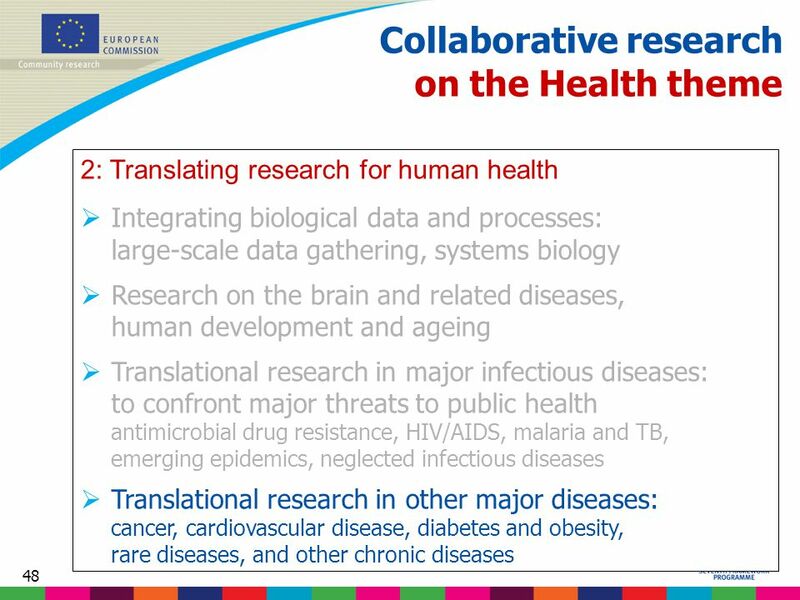 Definition of research needs and priorities in Europe in the area of Emerging Infectious Epidemics (CA or SA). 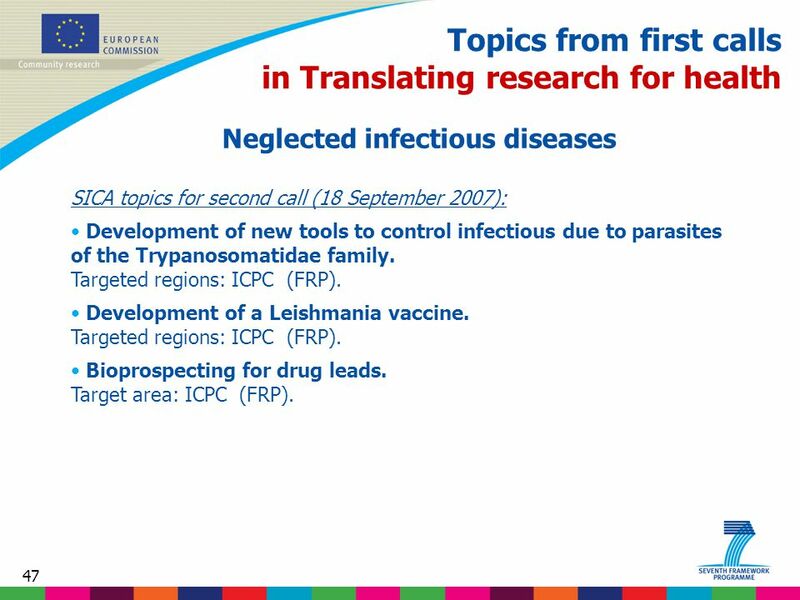 47 47 Topics from first calls in Translating research for health Neglected infectious diseases SICA topics for second call (18 September 2007): Development of new tools to control infectious due to parasites of the Trypanosomatidae family. Targeted regions: ICPC (FRP). Development of a Leishmania vaccine. Targeted regions: ICPC (FRP). Bioprospecting for drug leads. Target area: ICPC (FRP). 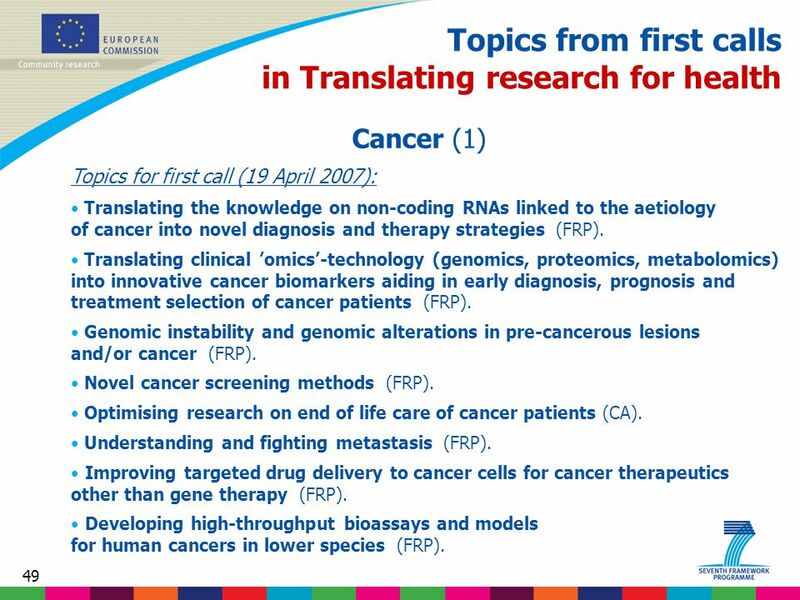 49 49 Topics from first calls in Translating research for health Cancer (1) Topics for first call (19 April 2007): Translating the knowledge on non-coding RNAs linked to the aetiology of cancer into novel diagnosis and therapy strategies (FRP). Translating clinical ’omics’-technology (genomics, proteomics, metabolomics) into innovative cancer biomarkers aiding in early diagnosis, prognosis and treatment selection of cancer patients (FRP). Genomic instability and genomic alterations in pre-cancerous lesions and/or cancer (FRP). Novel cancer screening methods (FRP). Optimising research on end of life care of cancer patients (CA). Understanding and fighting metastasis (FRP). Improving targeted drug delivery to cancer cells for cancer therapeutics other than gene therapy (FRP). Developing high-throughput bioassays and models for human cancers in lower species (FRP). 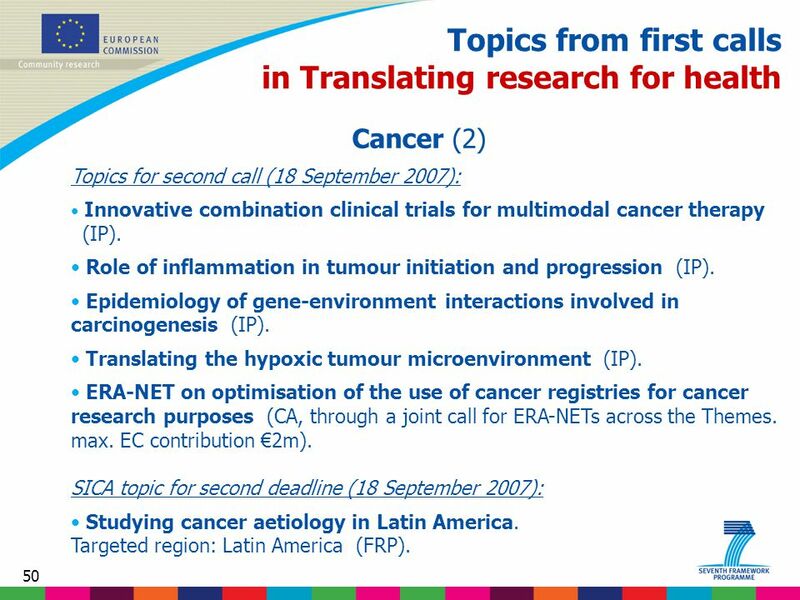 50 50 Topics from first calls in Translating research for health Cancer (2) Topics for second call (18 September 2007): Innovative combination clinical trials for multimodal cancer therapy (IP). Role of inflammation in tumour initiation and progression (IP). Epidemiology of gene-environment interactions involved in carcinogenesis (IP). Translating the hypoxic tumour microenvironment (IP). 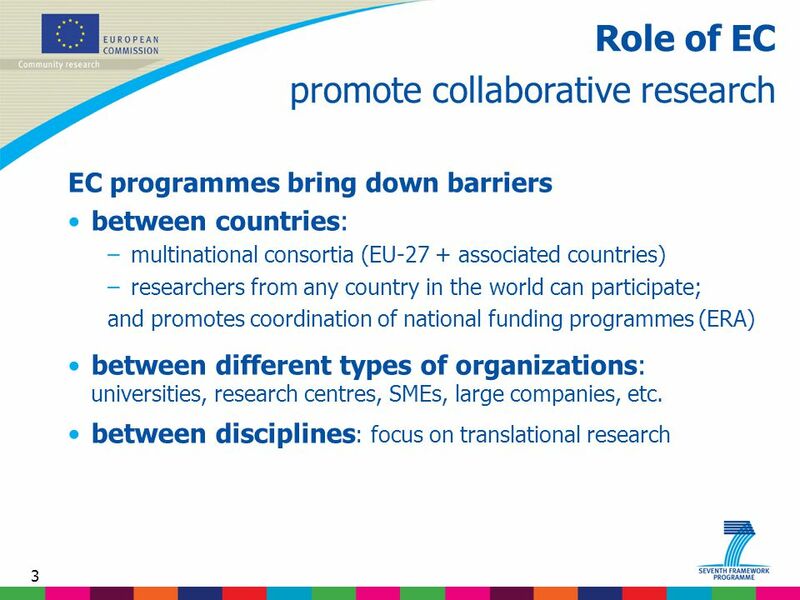 ERA-NET on optimisation of the use of cancer registries for cancer research purposes (CA, through a joint call for ERA-NETs across the Themes. max. EC contribution €2m). 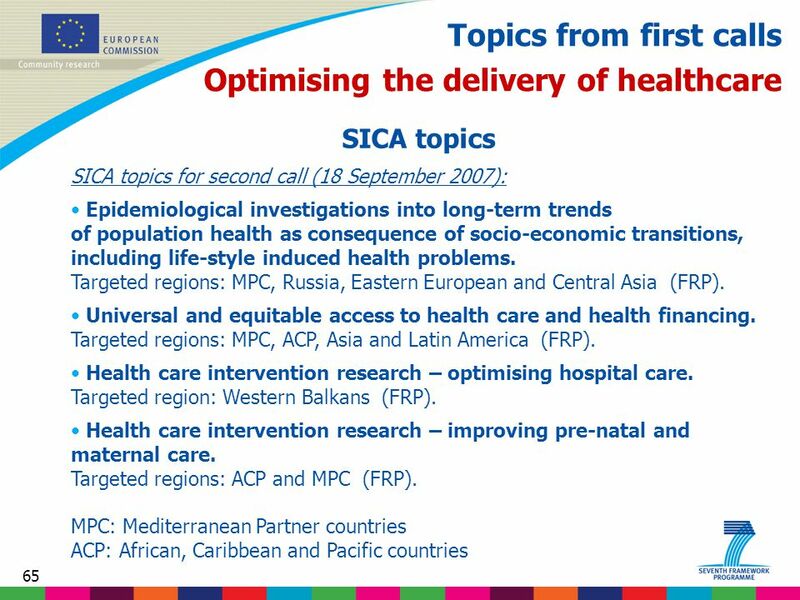 SICA topic for second deadline (18 September 2007): Studying cancer aetiology in Latin America. Targeted region: Latin America (FRP). 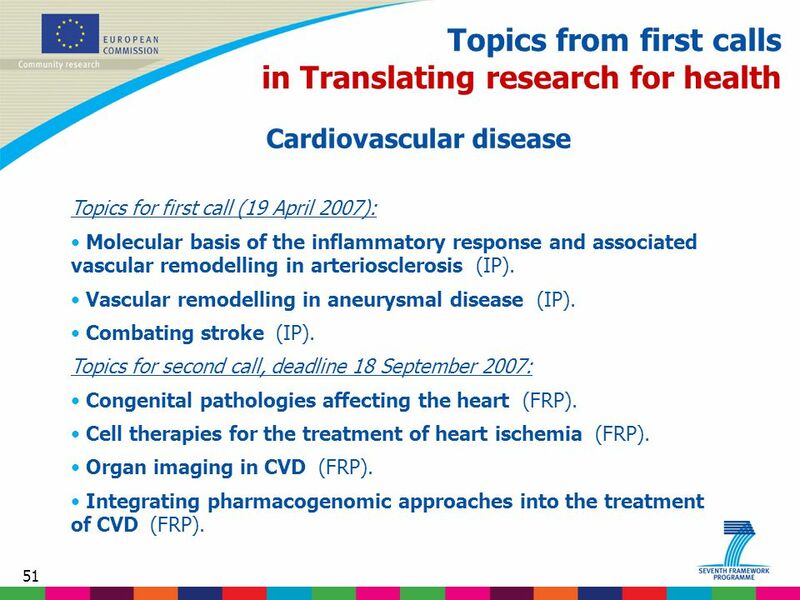 51 51 Topics from first calls in Translating research for health Cardiovascular disease Topics for first call (19 April 2007): Molecular basis of the inflammatory response and associated vascular remodelling in arteriosclerosis (IP). Vascular remodelling in aneurysmal disease (IP). Combating stroke (IP). Topics for second call, deadline 18 September 2007: Congenital pathologies affecting the heart (FRP). Cell therapies for the treatment of heart ischemia (FRP). Organ imaging in CVD (FRP). Integrating pharmacogenomic approaches into the treatment of CVD (FRP). 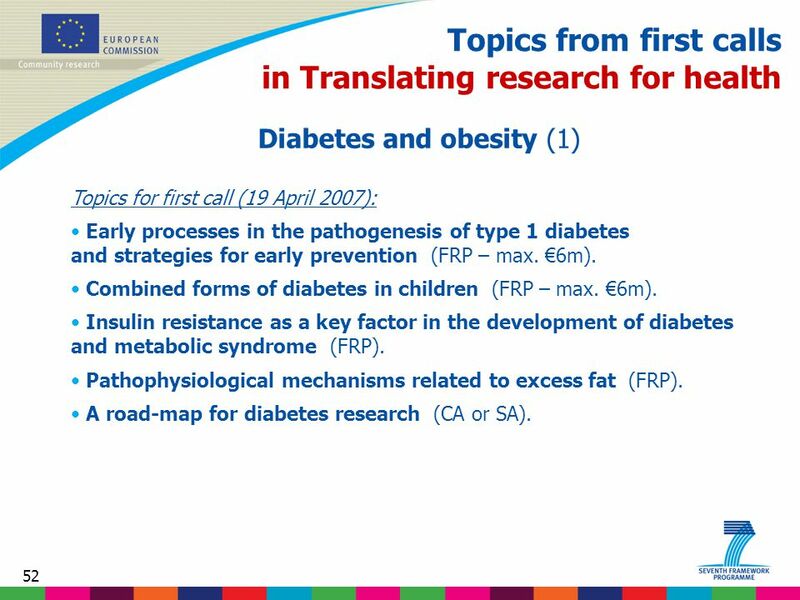 52 52 Topics from first calls in Translating research for health Diabetes and obesity (1) Topics for first call (19 April 2007): Early processes in the pathogenesis of type 1 diabetes and strategies for early prevention (FRP – max. €6m). Combined forms of diabetes in children (FRP – max. €6m). Insulin resistance as a key factor in the development of diabetes and metabolic syndrome (FRP). Pathophysiological mechanisms related to excess fat (FRP). A road-map for diabetes research (CA or SA). 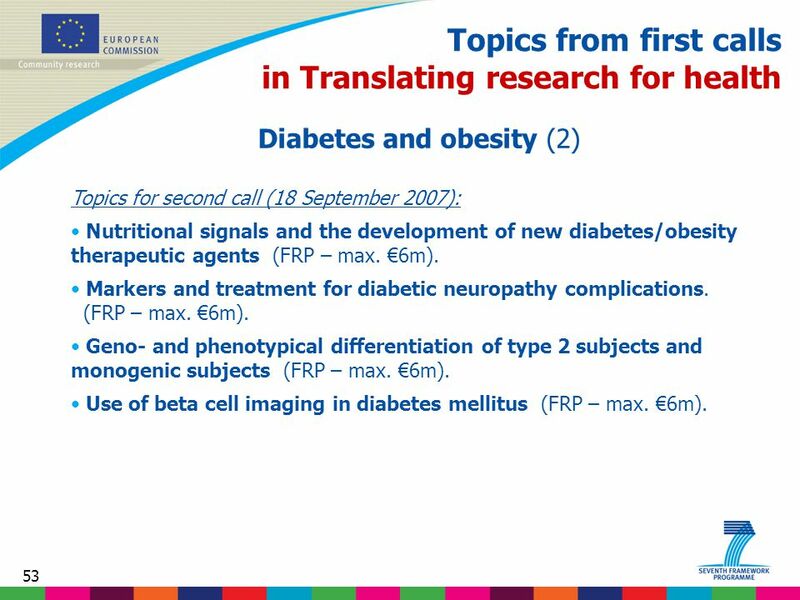 53 53 Topics from first calls in Translating research for health Diabetes and obesity (2) Topics for second call (18 September 2007): Nutritional signals and the development of new diabetes/obesity therapeutic agents (FRP – max. €6m). Markers and treatment for diabetic neuropathy complications. (FRP – max. €6m). Geno- and phenotypical differentiation of type 2 subjects and monogenic subjects (FRP – max. €6m). Use of beta cell imaging in diabetes mellitus (FRP – max. €6m). 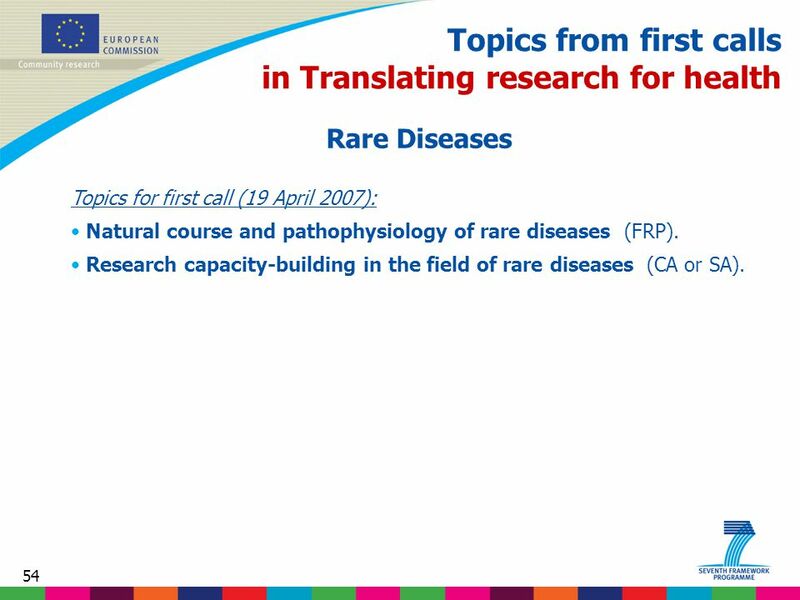 54 54 Topics from first calls in Translating research for health Rare Diseases Topics for first call (19 April 2007): Natural course and pathophysiology of rare diseases (FRP). Research capacity-building in the field of rare diseases (CA or SA). 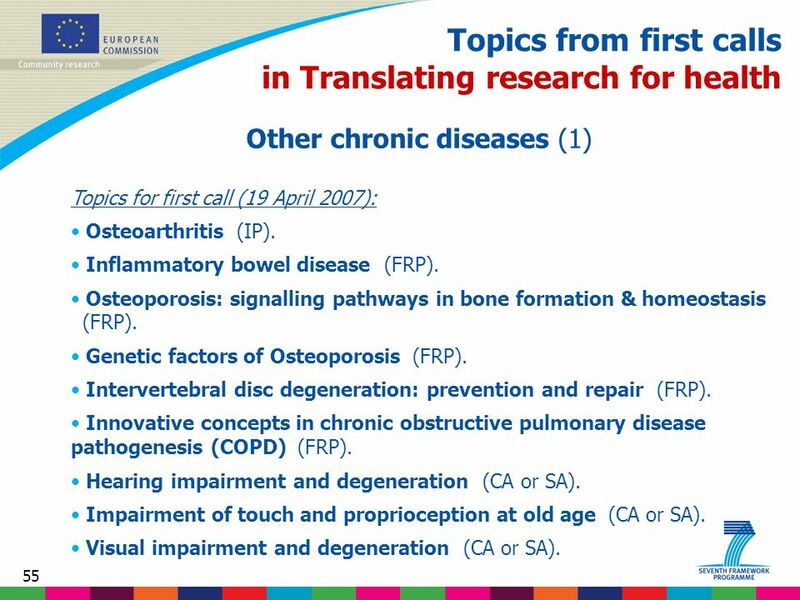 55 55 Topics from first calls in Translating research for health Other chronic diseases (1) Topics for first call (19 April 2007): Osteoarthritis (IP). Inflammatory bowel disease (FRP). Osteoporosis: signalling pathways in bone formation & homeostasis (FRP). Genetic factors of Osteoporosis (FRP). Intervertebral disc degeneration: prevention and repair (FRP). Innovative concepts in chronic obstructive pulmonary disease pathogenesis (COPD) (FRP). Hearing impairment and degeneration (CA or SA). Impairment of touch and proprioception at old age (CA or SA). Visual impairment and degeneration (CA or SA). 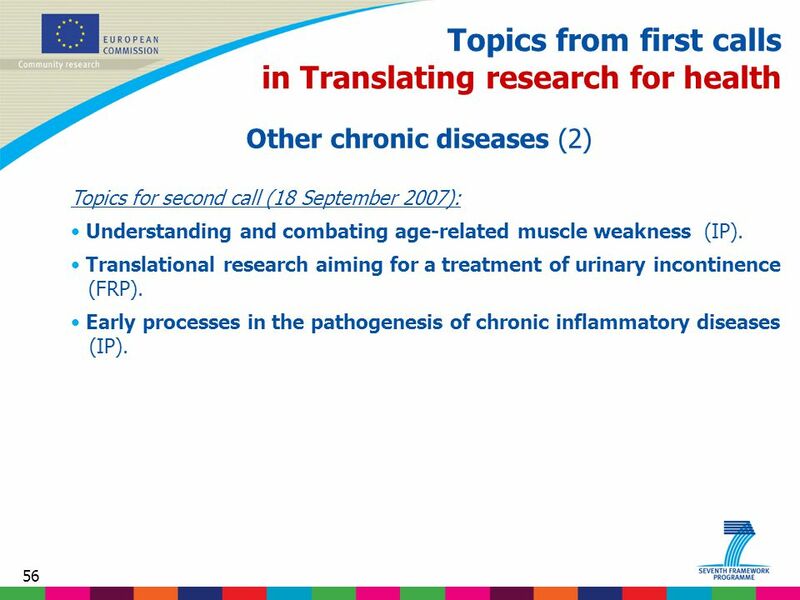 56 56 Topics from first calls in Translating research for health Other chronic diseases (2) Topics for second call (18 September 2007): Understanding and combating age-related muscle weakness (IP). Translational research aiming for a treatment of urinary incontinence (FRP). Early processes in the pathogenesis of chronic inflammatory diseases (IP). 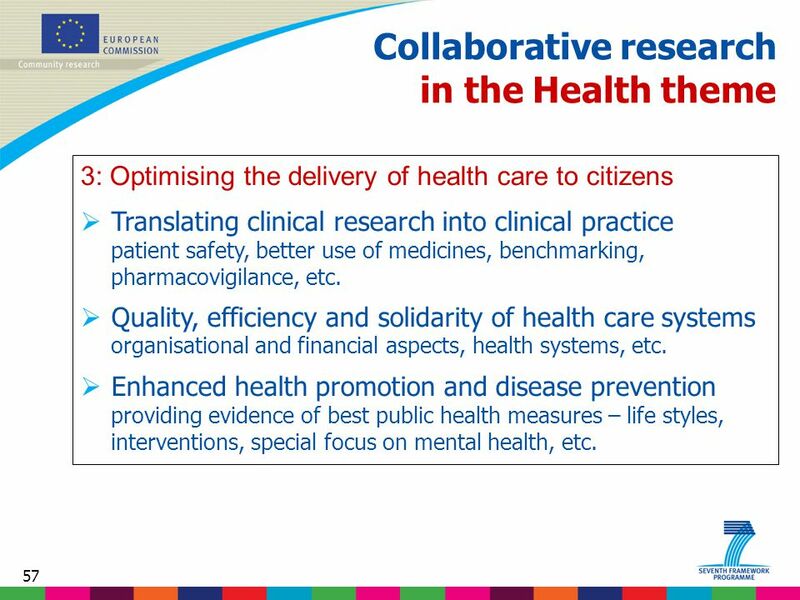 57 57 Collaborative research in the Health theme 3: Optimising the delivery of health care to citizens  Translating clinical research into clinical practice patient safety, better use of medicines, benchmarking, pharmacovigilance, etc.  Quality, efficiency and solidarity of health care systems organisational and financial aspects, health systems, etc.  Enhanced health promotion and disease prevention providing evidence of best public health measures – life styles, interventions, special focus on mental health, etc. 58 58 Collaborative research in the Health theme 3: Optimising the delivery of health care to citizens  Translating clinical research into clinical practice patient safety, better use of medicines, benchmarking, pharmacovigilance, etc.  Quality, efficiency and solidarity of health care systems organisational and financial aspects, health systems, etc.  Enhanced health promotion and disease prevention providing evidence of best public health measures – life styles, interventions, special focus on mental health, etc. 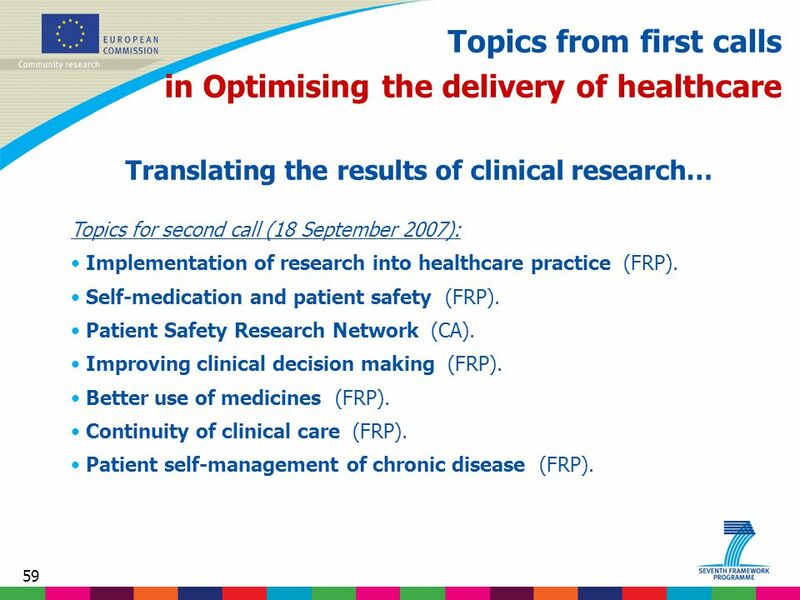 59 59 Topics from first calls in Optimising the delivery of healthcare Translating the results of clinical research… Topics for second call (18 September 2007): Implementation of research into healthcare practice (FRP). Self-medication and patient safety (FRP). Patient Safety Research Network (CA). Improving clinical decision making (FRP). Better use of medicines (FRP). Continuity of clinical care (FRP). Patient self-management of chronic disease (FRP). 60 60 Collaborative research in the Health theme 3: Optimising the delivery of health care to citizens  Translating clinical research into clinical practice patient safety, better use of medicines, benchmarking, pharmacovigilance, etc.  Quality, efficiency and solidarity of health care systems organisational and financial aspects, health systems, etc.  Enhanced health promotion and disease prevention providing evidence of best public health measures – life styles, interventions, special focus on mental health, etc. 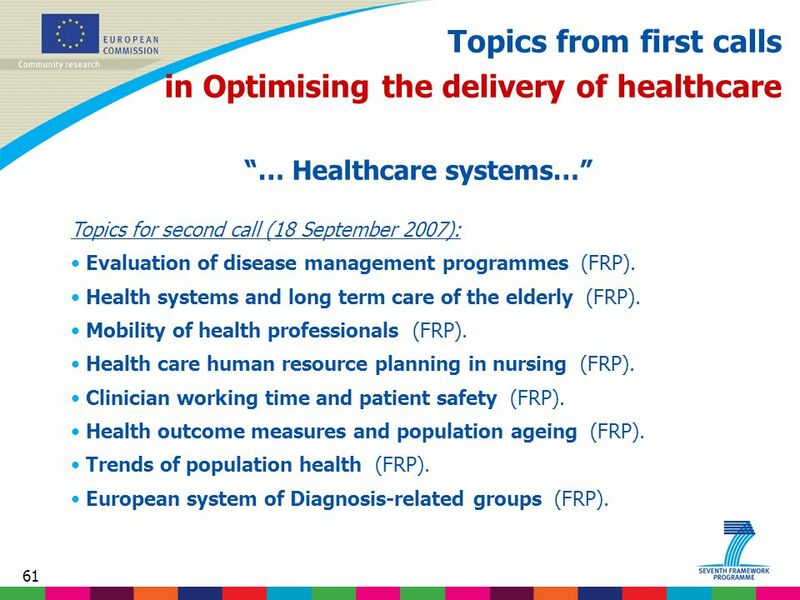 61 61 Topics from first calls in Optimising the delivery of healthcare “… Healthcare systems…” Topics for second call (18 September 2007): Evaluation of disease management programmes (FRP). Health systems and long term care of the elderly (FRP). 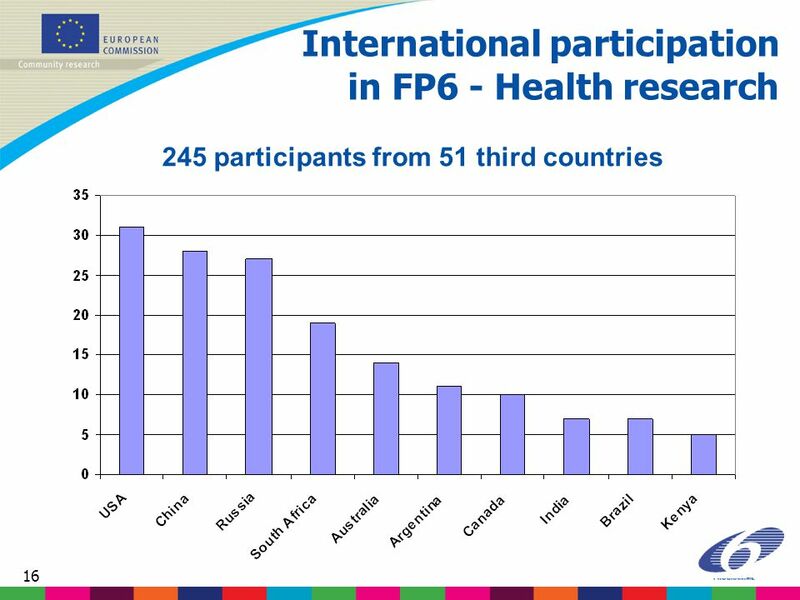 Mobility of health professionals (FRP). Health care human resource planning in nursing (FRP). Clinician working time and patient safety (FRP). Health outcome measures and population ageing (FRP). 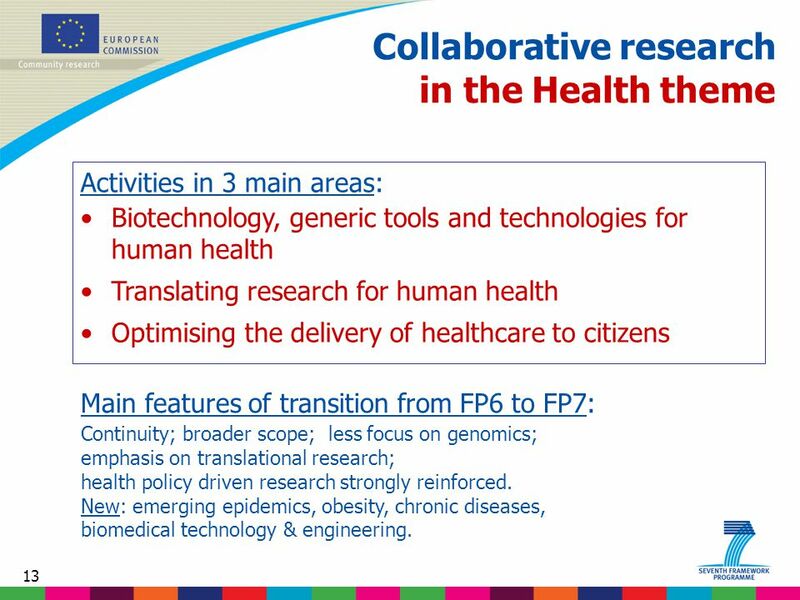 Trends of population health (FRP). European system of Diagnosis-related groups (FRP). 62 62 Collaborative research in the Health theme 3: Optimising the delivery of health care to citizens  Translating clinical research into clinical practice patient safety, better use of medicines, benchmarking, pharmacovigilance, etc.  Quality, efficiency and solidarity of health care systems organisational and financial aspects, health systems, etc.  Enhanced health promotion and disease prevention providing evidence of best public health measures – life styles, interventions, special focus on mental health, etc. 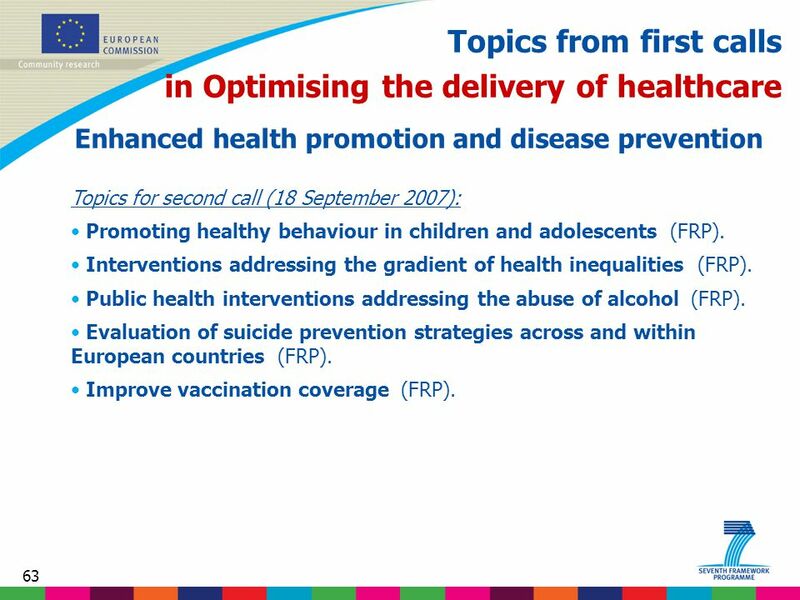 63 63 Topics from first calls in Optimising the delivery of healthcare Enhanced health promotion and disease prevention Topics for second call (18 September 2007): Promoting healthy behaviour in children and adolescents (FRP). 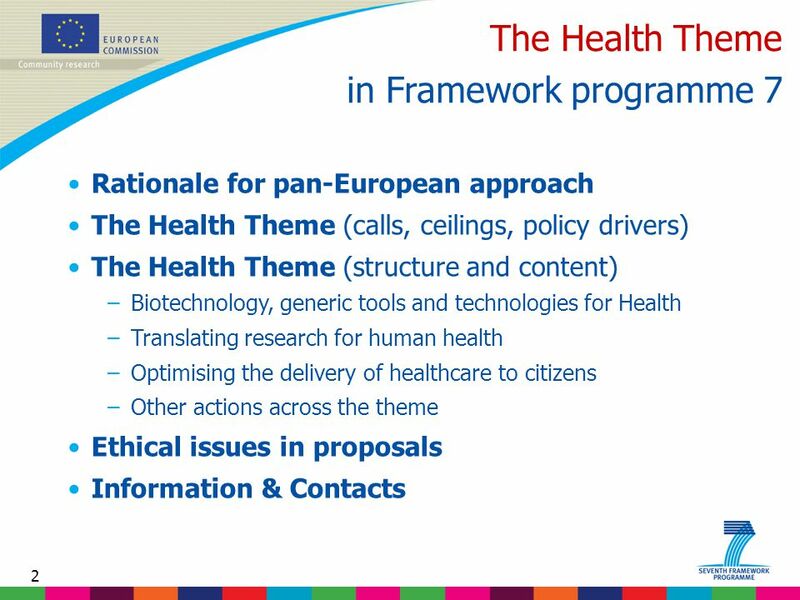 Interventions addressing the gradient of health inequalities (FRP). Public health interventions addressing the abuse of alcohol (FRP). Evaluation of suicide prevention strategies across and within European countries (FRP). Improve vaccination coverage (FRP). 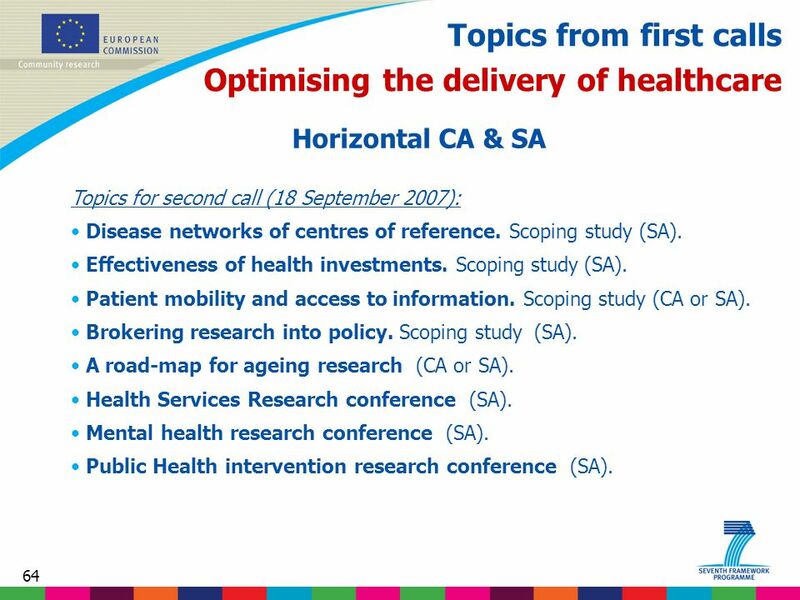 64 64 Topics from first calls Optimising the delivery of healthcare Horizontal CA & SA Topics for second call (18 September 2007): Disease networks of centres of reference. Scoping study (SA). 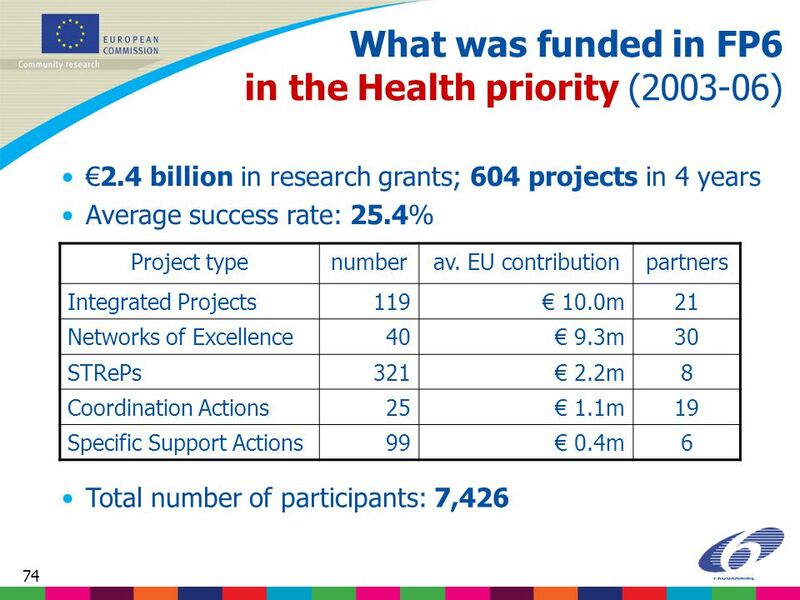 Effectiveness of health investments. Scoping study (SA). Patient mobility and access to information. Scoping study (CA or SA). Brokering research into policy. Scoping study (SA). A road-map for ageing research (CA or SA). Health Services Research conference (SA). Mental health research conference (SA). Public Health intervention research conference (SA). 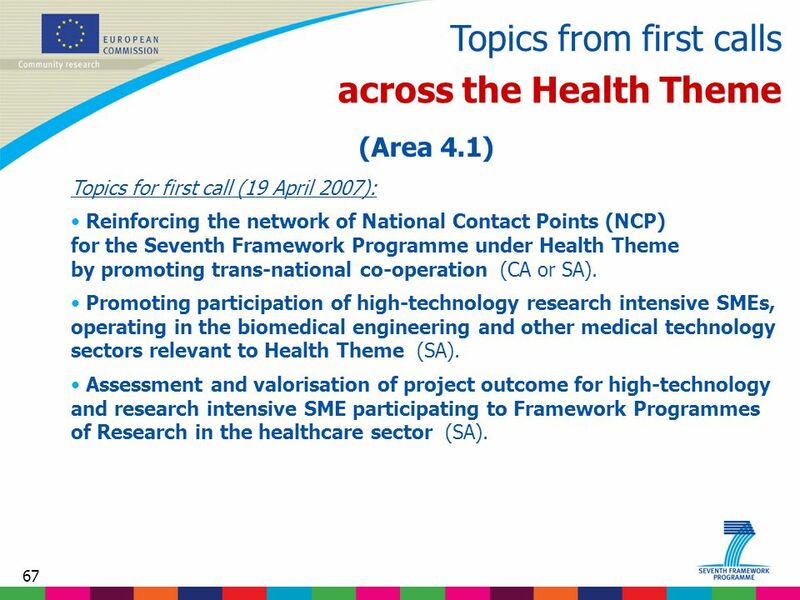 67 67 Topics from first calls across the Health Theme (Area 4.1) Topics for first call (19 April 2007): Reinforcing the network of National Contact Points (NCP) for the Seventh Framework Programme under Health Theme by promoting trans-national co-operation (CA or SA). 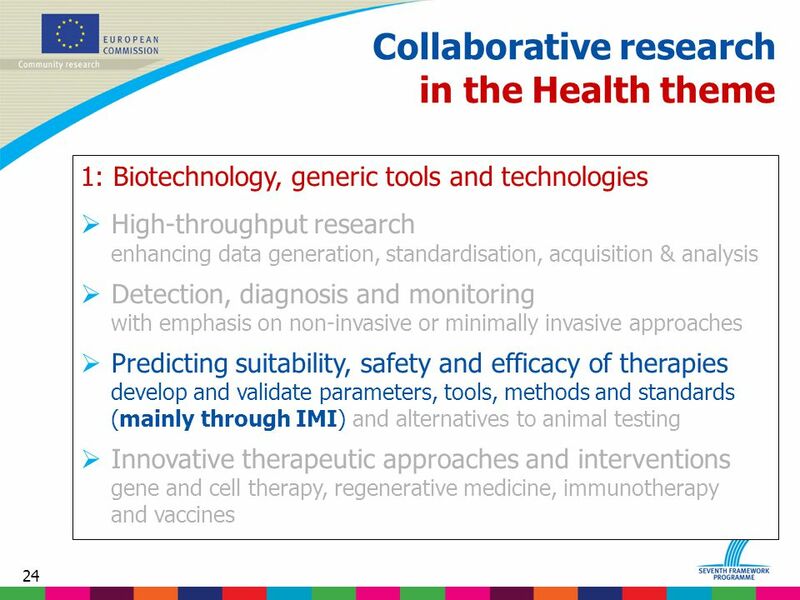 Promoting participation of high-technology research intensive SMEs, operating in the biomedical engineering and other medical technology sectors relevant to Health Theme (SA). Assessment and valorisation of project outcome for high-technology and research intensive SME participating to Framework Programmes of Research in the healthcare sector (SA). 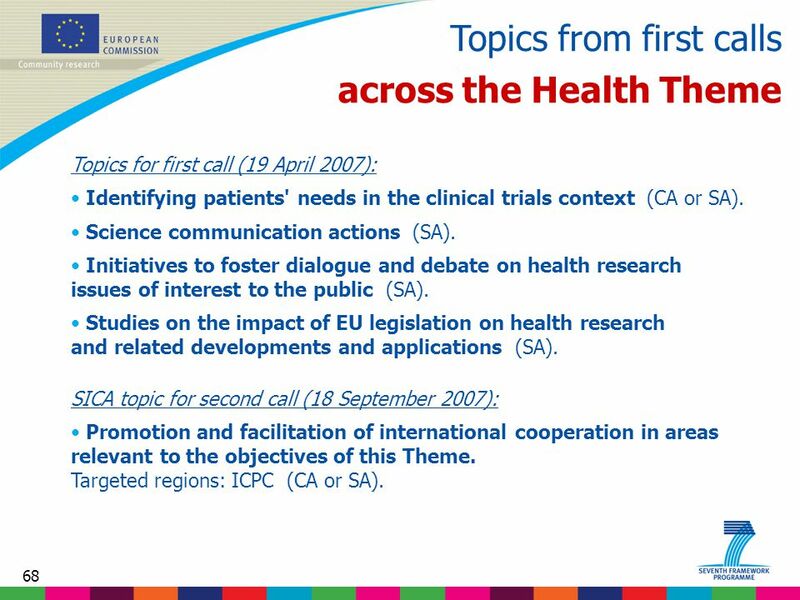 68 68 Topics from first calls across the Health Theme Topics for first call (19 April 2007): Identifying patients' needs in the clinical trials context (CA or SA). Science communication actions (SA). Initiatives to foster dialogue and debate on health research issues of interest to the public (SA). 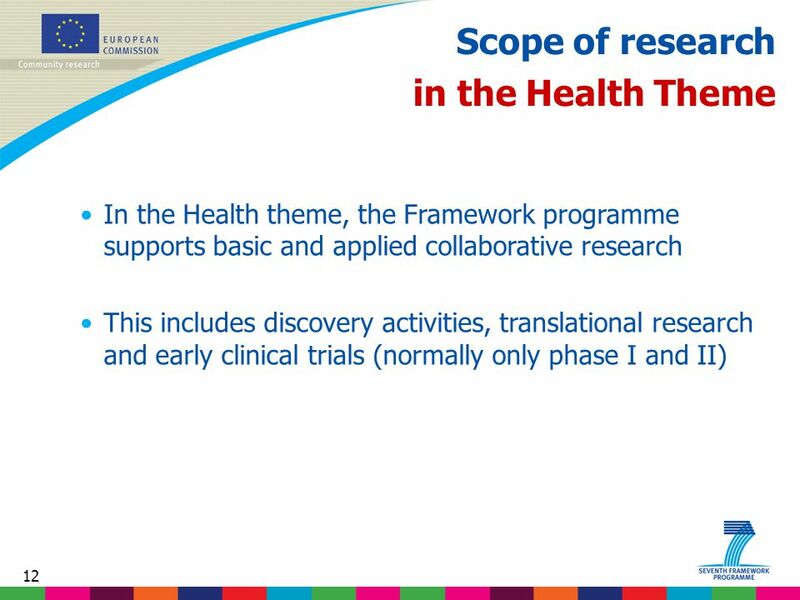 Studies on the impact of EU legislation on health research and related developments and applications (SA). 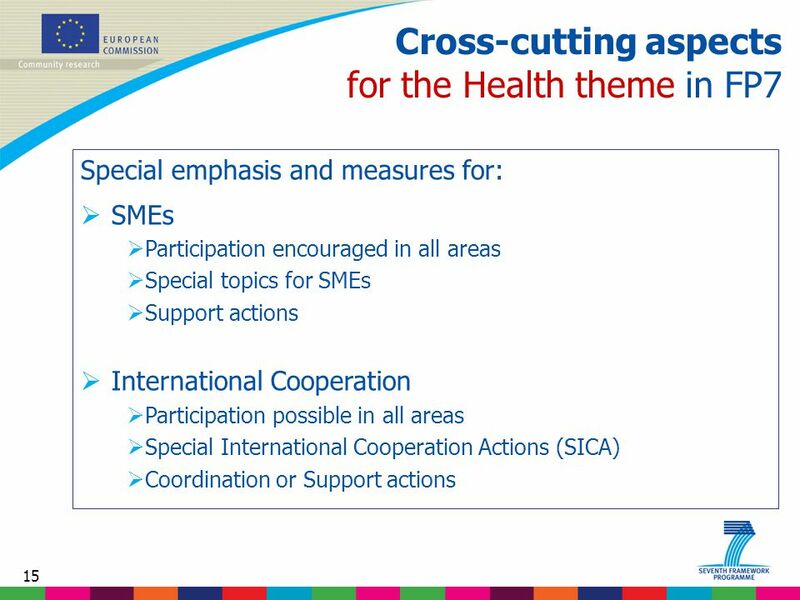 SICA topic for second call (18 September 2007): Promotion and facilitation of international cooperation in areas relevant to the objectives of this Theme. 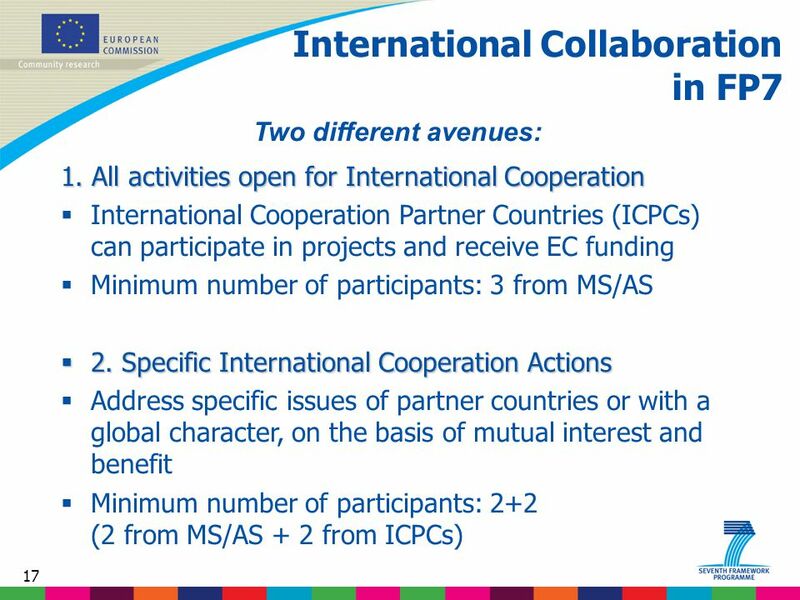 Targeted regions: ICPC (CA or SA). 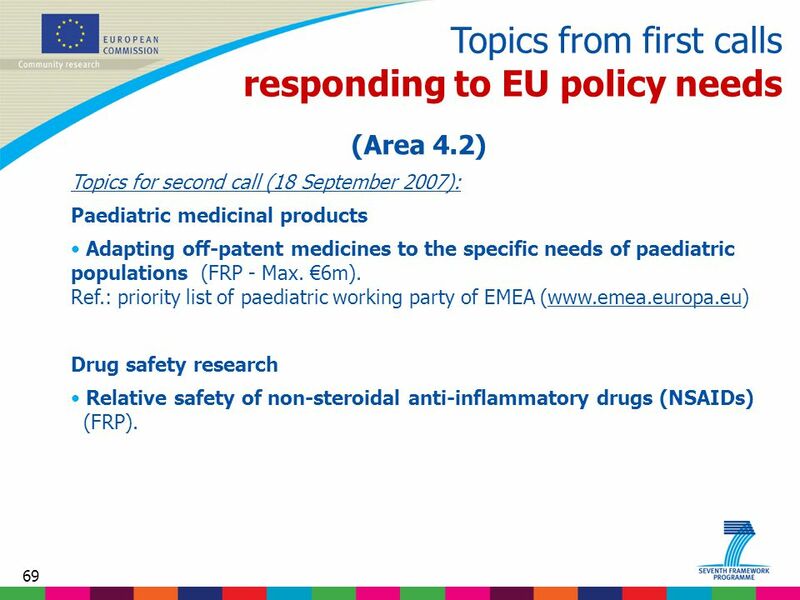 69 69 Topics from first calls responding to EU policy needs (Area 4.2) Topics for second call (18 September 2007): Paediatric medicinal products Adapting off-patent medicines to the specific needs of paediatric populations (FRP - Max. €6m). Ref. 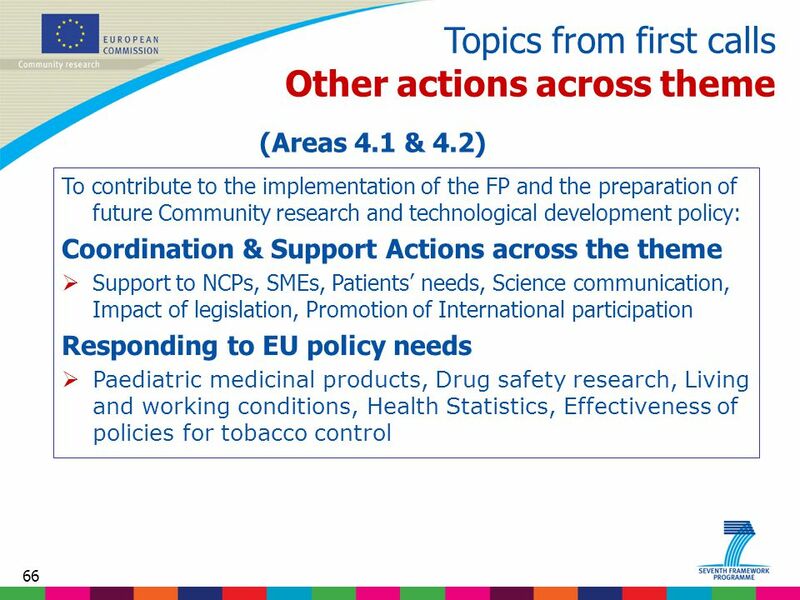 : priority list of paediatric working party of EMEA (www.emea.europa.eu) Drug safety research Relative safety of non-steroidal anti-inflammatory drugs (NSAIDs) (FRP). 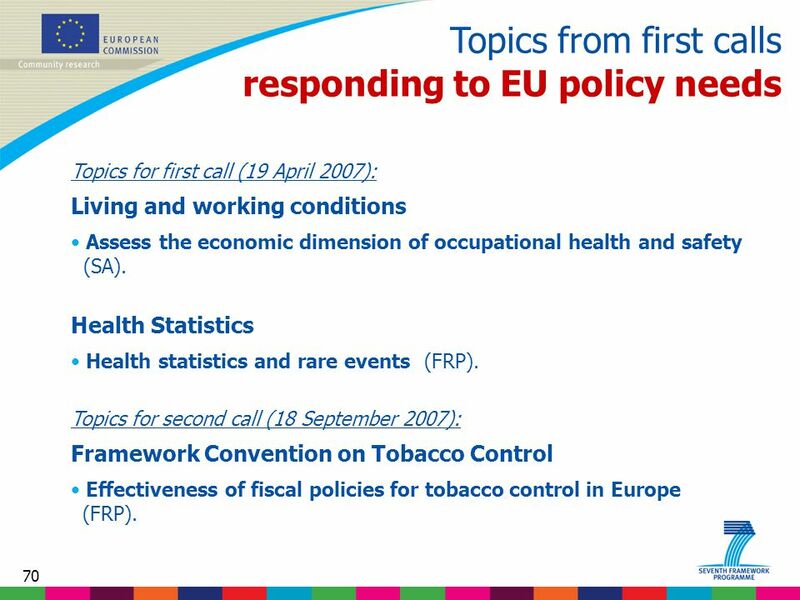 70 70 Topics from first calls responding to EU policy needs Topics for first call (19 April 2007): Living and working conditions Assess the economic dimension of occupational health and safety (SA). Health Statistics Health statistics and rare events (FRP). 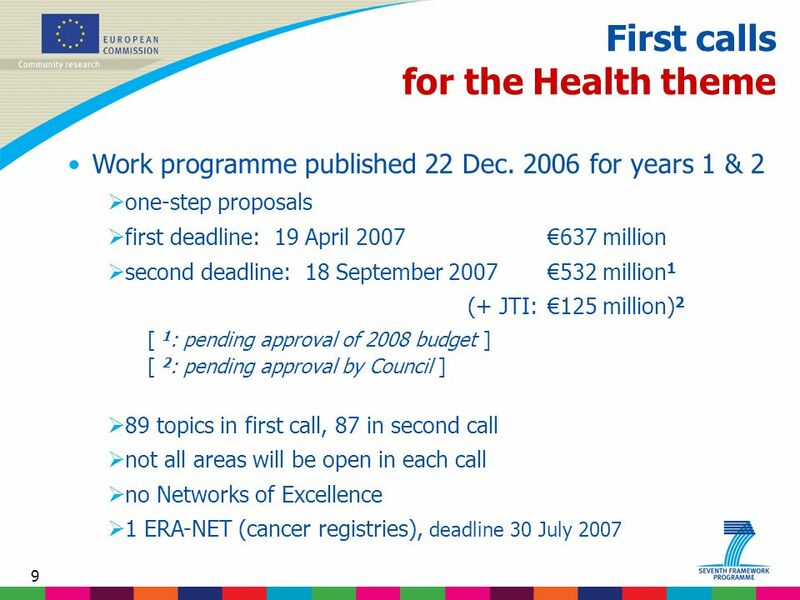 Topics for second call (18 September 2007): Framework Convention on Tobacco Control Effectiveness of fiscal policies for tobacco control in Europe (FRP). 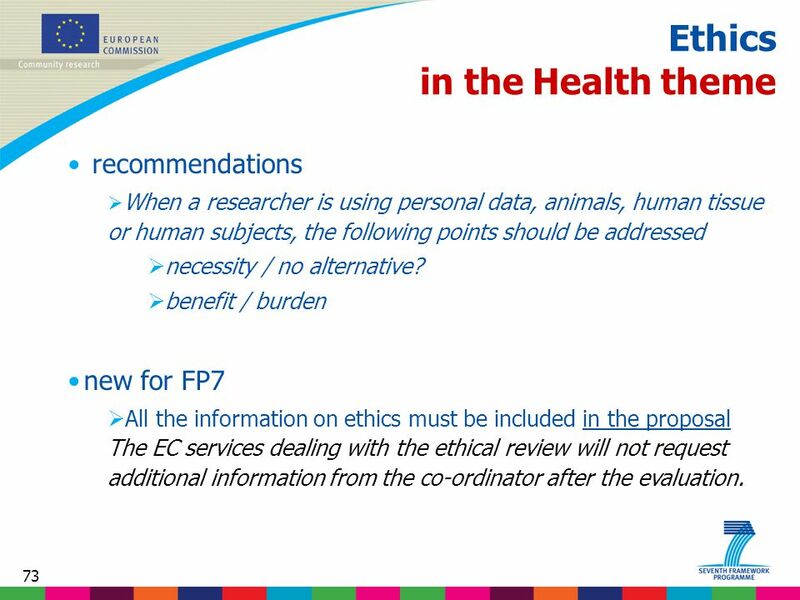 73 73 Ethics in the Health theme recommendations  When a researcher is using personal data, animals, human tissue or human subjects, the following points should be addressed  necessity / no alternative? 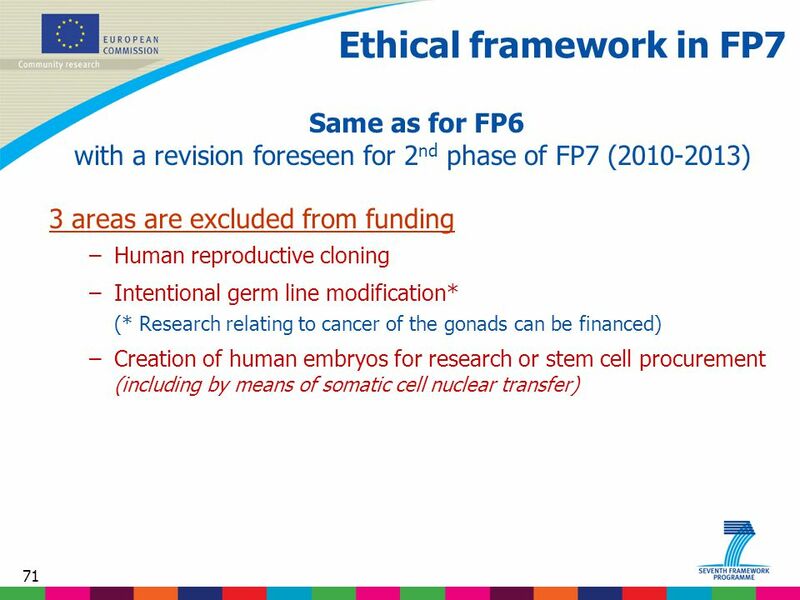  benefit / burden new for FP7  All the information on ethics must be included in the proposal The EC services dealing with the ethical review will not request additional information from the co-ordinator after the evaluation. 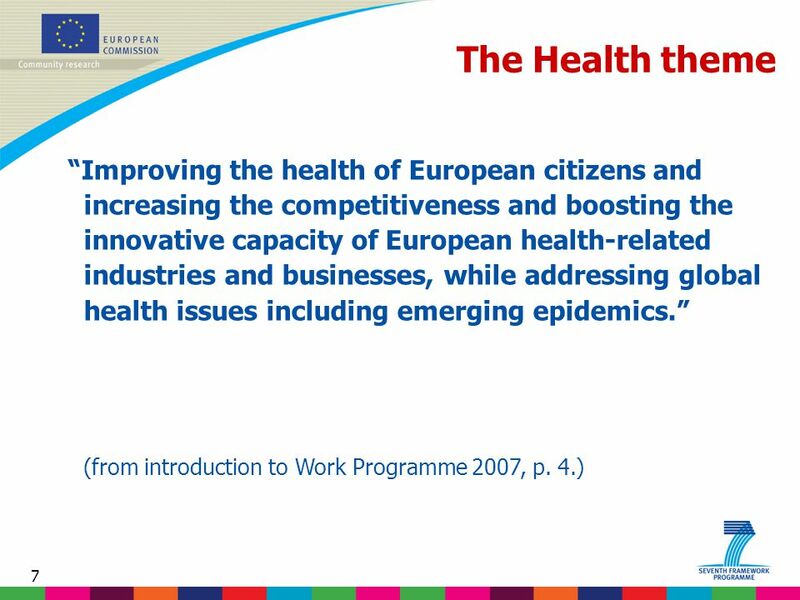 Download ppt "1 Stéphane Hogan Head of Coordination Unit Directorate Health DG Research – European Commission Launching FP7 – Riga, 5 February 2007 The Health theme." 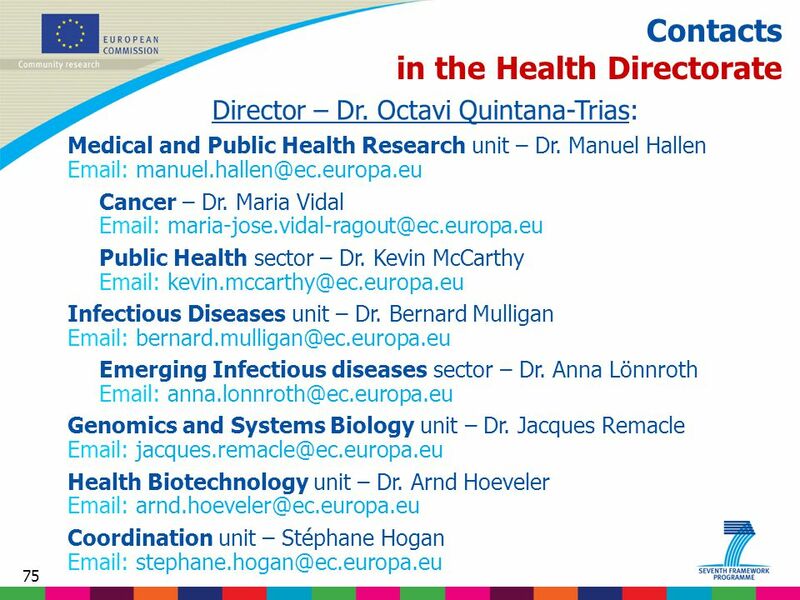 Science, research and developmentEuropean Commission LIFE SCIENCES, GENOMICS AND BIOTECHNOLOGY FOR HEALTH Applications of knowledge and technologies in. 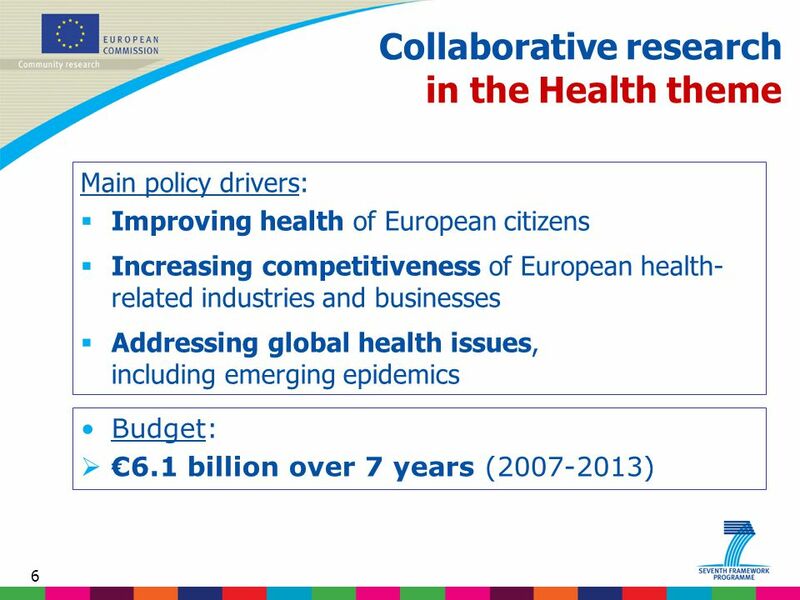 Building a Europe of Knowledge Towards the Seventh Framework Programme Medical and Public Health Research DG Research European Commission Brussels. 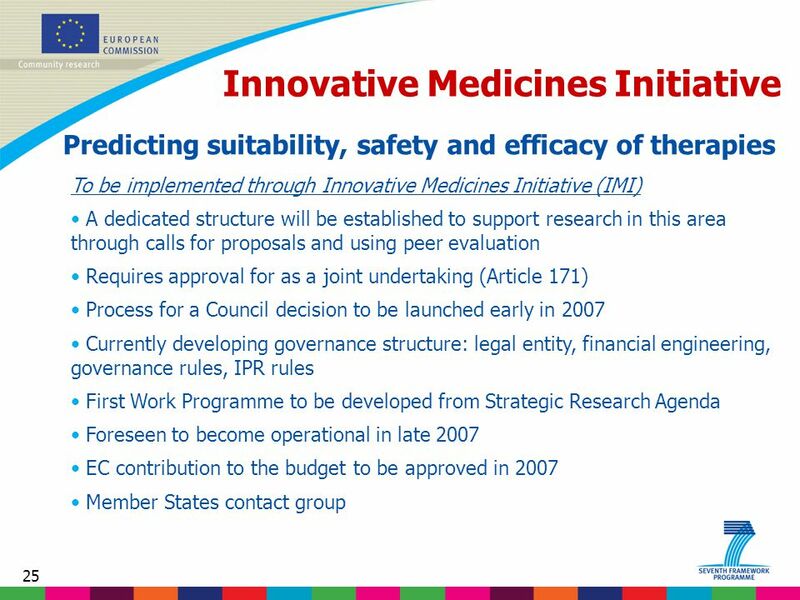 Research & Innovation Evolution from IMI1 to IMI2: challenges ahead Elmar Nimmesgern, PhD DG Research & Innovation 1. 1 Biomedical Sciences Public and Environmental Health Regenerative Medicine Translational Research. 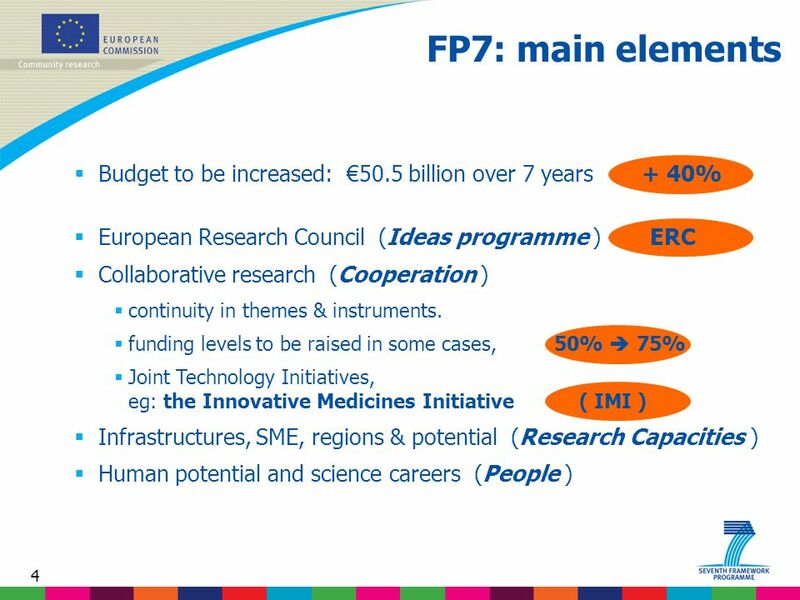 1 SMEs – a priority for FP6 Barend Verachtert DG Research Unit B3 - Research and SMEs.